There is very little doubt that in almost all circumstances the correct number of wheels for a car is four. That has of course not stopped keen inventors from trying either more or less, and here you see some of the results. This page is strictly limited to cars; goods vehicles with six or more wheels are of course very common. I don't think there is any rational way you could call a vehicle with one wheel a car. The Museum has an extensive collection of monowheels, but very few of them have any form of bodywork and the majority can only carry one person. A possible candidate might be the monowheel tank (preferably as the civilian version). This design's claim to be a one-wheeled car is somewhat undermined by the two hefty stabiliser wheels at the back. It appears however that these can be raised by a lever once you've got up speed. Other objections are that the steering is by handlebars rather than a steering-wheel, and that it seems to be strictly a one-seater. 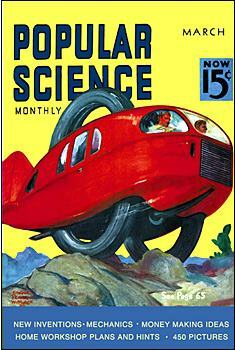 Anyhow, that's the best I can do for the moment, but I suspect that a trawl through the covers of Popular Science and similiar journals would soon throw up something that could claim more plausibly to be a one-wheeled car. This is an artist's impression and it is extremely unlikely that it was ever built. If we permit ourselves the luxury of two wheels for a car, then we find ourselves with a good number of genuine candidates. Two-wheeled cars with gyroscopes are dealt with here and here. 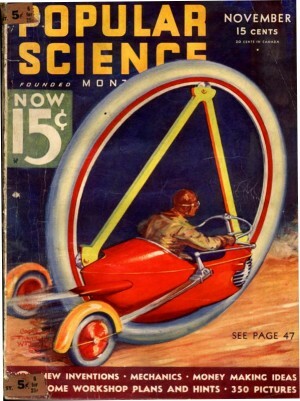 Two-wheeled cars without gyroscopes are dealt with on the 2-wheeled car page. These cars all have one wheel at the front and one at the back. If you have two wheels side-by-side then you have a diwheel. The Museum has a large collection of diwheels, but this artist's impression is the nearest it gets to an actual car. This design (which I am quite sure no one attempted to build) certainly has bodywork and clearly seats at least two people; probably more judging by the windows halfway along the cabin. Note the rudder at the back for high-speed steering. You can read more this vehicle on this page. It is far from clear how you would change a wheel should you suffer a puncture. This design has not been tested for practicality. There have been a huge number of three-wheeled cars. Here only a few especially significant or odd designs are displayed. 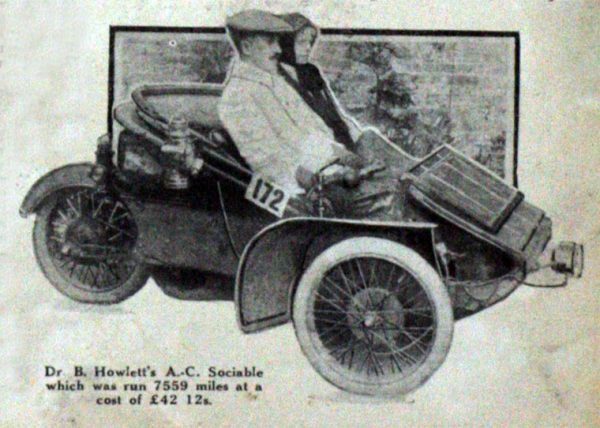 The A C Sociable was a very successful early three-wheeler. It adopted what is usually considered to be the most stable configuration- two wheels in front and one at the back, like the Morgan. Driver and passenger sat side-by-side, making conversation easier, and so this was called the 'sociable' configuration. The original name was Auto Carriers Ltd. 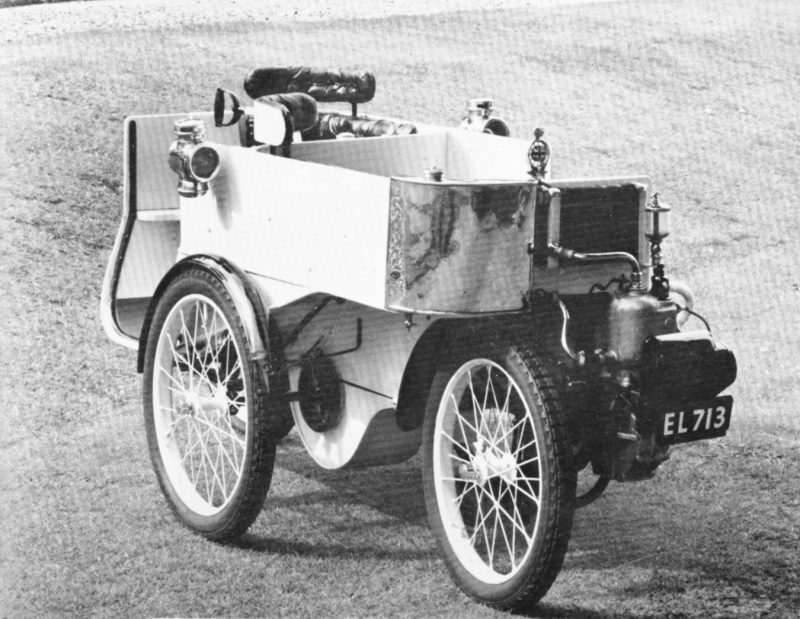 It had a 5.5 HP 631 cc air-cooled side-valve single-cylinder engine, and a two-speed epicyclic gearbox, with no reverse gear; final drive was by chain to the rear wheel. 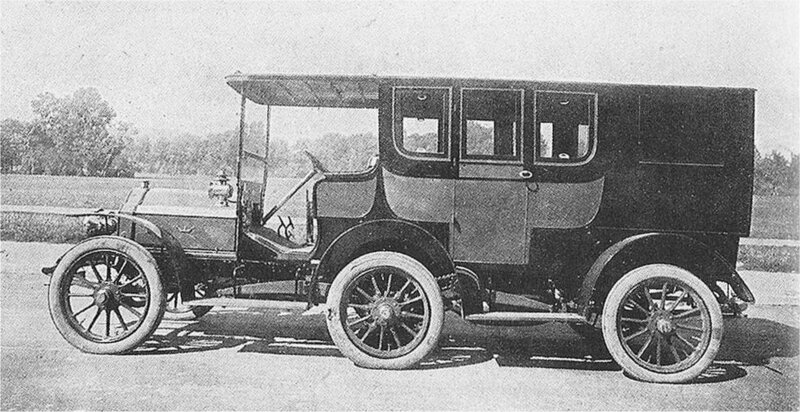 The front axle was solid with semi-elliptic leaf springs, while the single rear wheel had dual quarter-elliptic leaf springs. Brakes operated on the transmission and the rear wheel. The wheelbase was 70 inches. The A C Sociable has an entry on the A C Wikipedia page. An A C Sociable from the other side. Economical motoring. Date of picture unknown. 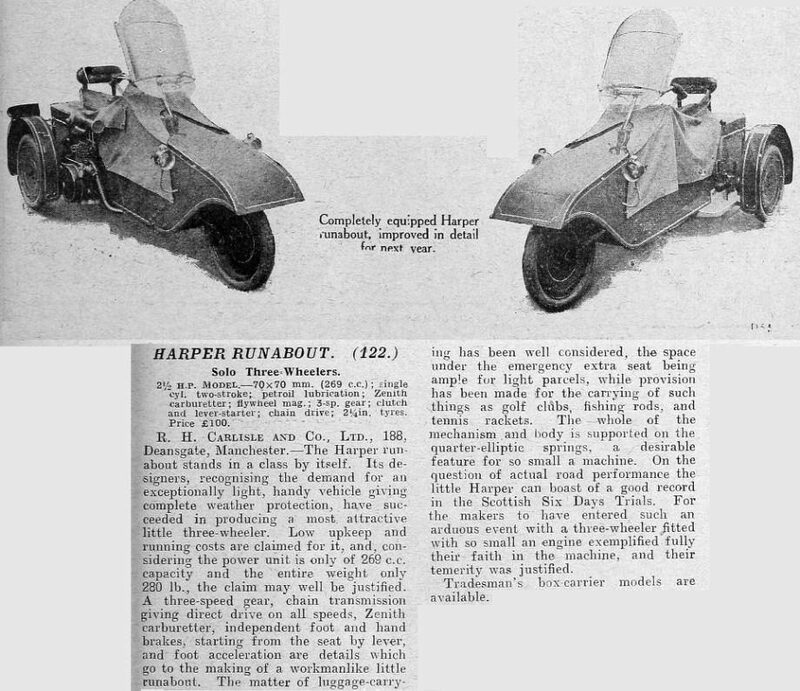 The Harper Runabout has a Wikipedia page but it has little information. The engine was a single-cylinder two-stroke Villiers of 269cc, which developed 2.5 HP, and drove the rear wheels by chain, via a three-speed gearbox. Starting was accomplished by a pull-up lever on the left hand side of the driver, which could be operated from a sitting position. This lever also functioned as a ratchet hand brake. There were quarter-elliptical springs on all three wheels, which were of pressed steel. Remarkably for the time, there were disc brakes on all three wheels. It was capable of an economical 100 mpg running at 40 mph. A total of about 500 machines were produced. This example from 1921 is in the Science Museum collection. The 'Brief Specification' gives some more technical details of the Harper. Note the acetylene lighting with an intriguing 'shaking grid generator'. I would like to know more about that... but Google is silent on the subject. And it is NOT a camouflaged motorcycle! Definitely not! This seems to be some sort of entry in a trade catalogue rather than an impartial article. The 'emergency extra seat', which somehow does not sound too alluring, allowed a passenger to sit behind the driver, facing backwards. 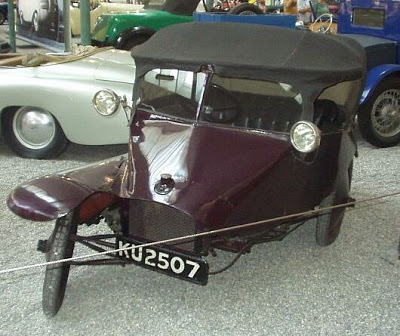 The Scott Sociable was a very odd sort of three-wheeled car manufactured from 1921 to 1925 by the Scott Autocar Company of Bradford, Yorkshire. This was an offshoot of the well-known and respected Scott Motorcycle Company. 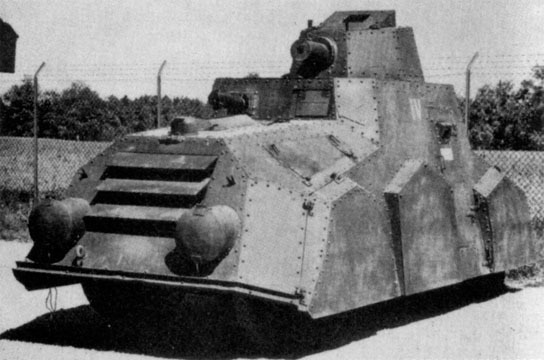 In the course of World War I Alfred Scott developed sidecar machine gun carriers. They were not very successful. After the war he tried a similiar configuration for civilian transport. There emerged a highly asymmetrical three-wheel car with two wheels in line, with a third wheel out to the side and slightly behind the other rear wheel. (Overcoming the puncture drawback noted just above), though that was not the reason)The configuration resembled that of a motorcycle and sidecar combination, but looked very wrong. It looked just like a car with a wheel missing, and apparently handled like one. It was originally announced in 1916 as the Sociable, but production was postponed until 1921. About 200 were made before production stopped in 1924. 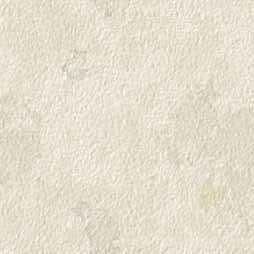 The cost of a complete Sociable was �273 in 1921, falling to �135 by 1924. Driver and passenger sat side-by-side; and this was called the 'sociable' configuration. This picture demonstrates all too clearly that the Scott Sociable just looked wrong, as if it was poised on the point of falling on its nose. 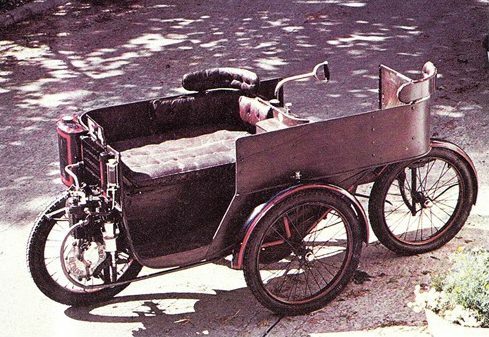 The Sociable had a triangulated tubular steel frame, and a proper steering wheel acting by rack and pinion on the front wheel. It was powered the Scott Company's own water-cooled 578 cc twin-cylinder two-stroke engine driving through a three-speed gearbox to the offside rear wheel only, by shaft; there was no differential, and no reverse gear. It has been recorded that turning was dangerous at speed; I'll bet it was. There are many, many, three-wheeled vehicles in the world. This may be the oddest. This Scott clearly dates from 1922. 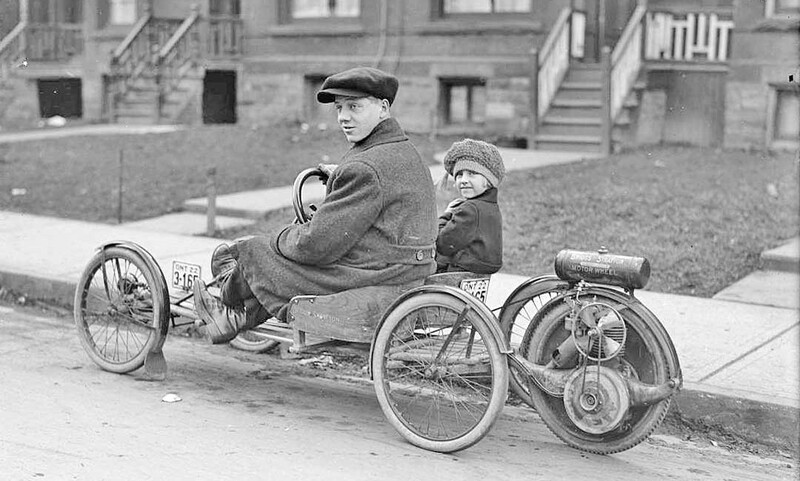 According to Timothy Jacobs, author of Lemons- The World's Worst Cars, "It had some of the characteristics of a motorcycle-and-sidecar arrangement, but without the flexibility, and could be extraordinarily treacherous to drive." I believe it. 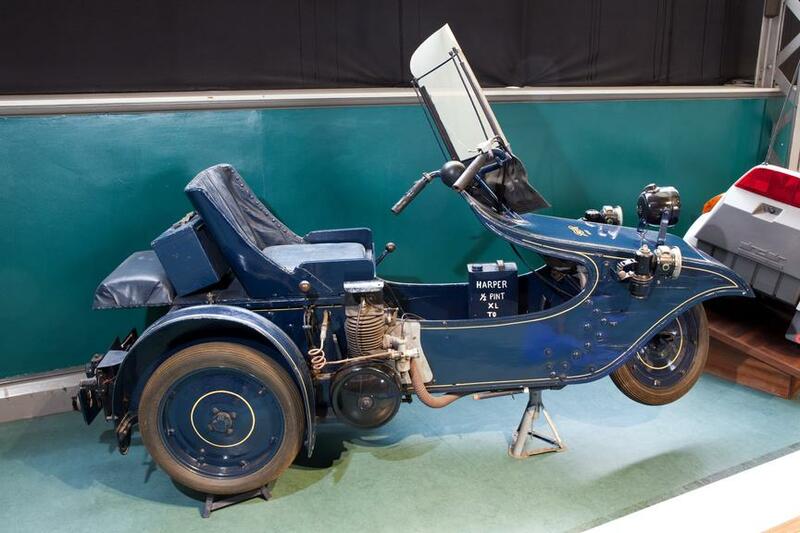 The major 3-wheeler manufacturers in Great Britain were Reliant and Bond. Ultimately Reliant bought out Bond, and it was Reliant that produced the famous Bond Bug. The Reliant Robin had a water-cooled engine (originally only 750cc) under the hatch at the front, driving the back axle via a conventional propshaft and differential. The last Robin came off the production lines in 2002, the last batch of 65 having leather seats, alloy wheels, and walnut dashboards. Now that is class. 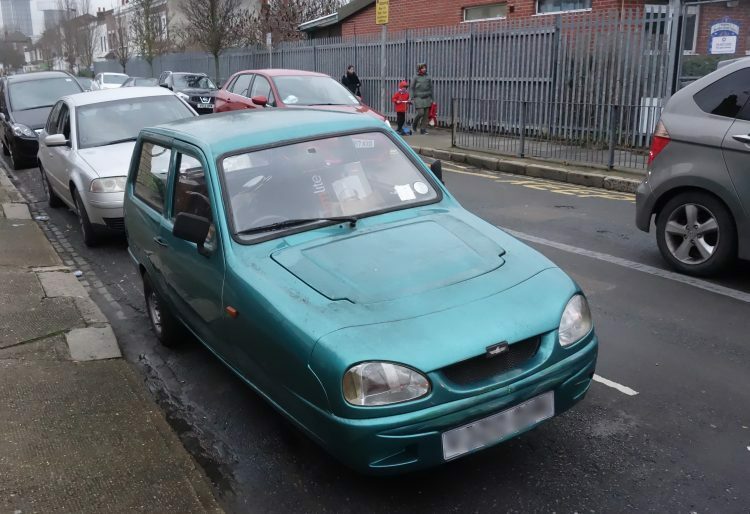 This Reliant lives a couple of steets away from me, and there is (or was) another living only half a mile away. I see one driving around occasionally, but have not so far been alert enough to spot which it is. The crash-worthiness of a fibreglass-bodied car is not great. As was demonstrated when a friend of mine was killed in a Robin. 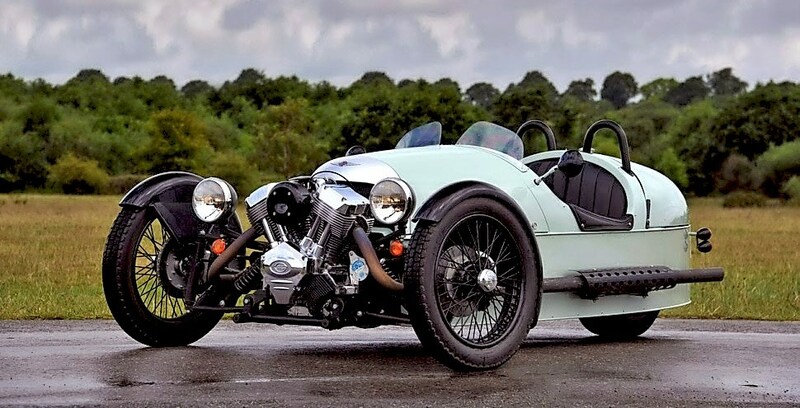 The Morgan company began selling three-wheelers with one wheel at the rear and a V-twin engine at the front in 1911, and continued until 1952. The company announced that production of a version using a Harley-Davidson V-twin would be restarted in 2012, but the production models actually used an S&S engine. This is a three-wheeler of a rather different stamp. It is powered by a big V-twin engine at the front (yes, I suppose that is obvious) that drives the rear wheel. There is a Wikipedia page on Morgan. A perhaps non-obvious drawback of three-wheelers is that since you are making three tracks on the road, the chances of encountering a randomly-placed nail are increased by 50%. 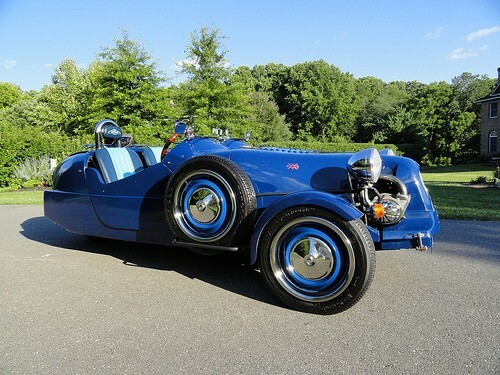 The Lomax three-wheeler is a British kit car in the same configuration as the Morgan, with two wheels at the front and one at the back. It has a fibreglass body mounted on a Citro�n 2CV or Citro�n Dyane floorpan. In later versions a steel tube chassis was introduced to replace the floorplan. The first Lomax 223's were powered by a Citroen 2CV 602cc engine, which is a horizontally-opposed air-cooled twin. 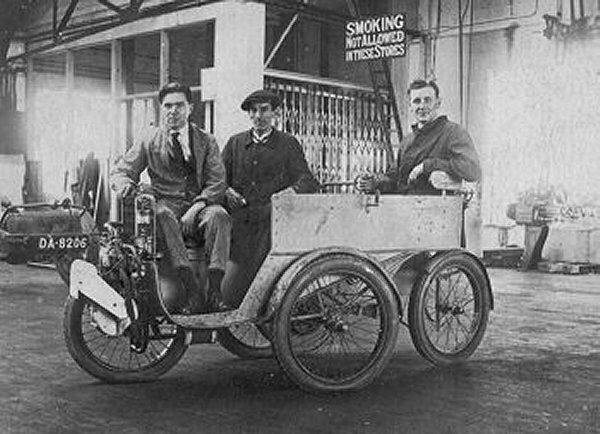 The Lomax is still in limited production at Cradley Motor Works, but production seems to be winding down. The Lomax has a Wikipedia page. 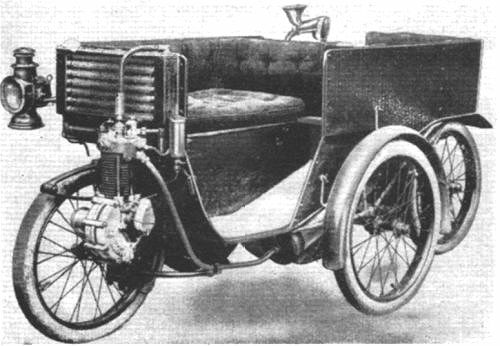 This car was the first produced by the famous Sunbeam company. They bought in a design from a certain Maxwell Mabley-Smith, whose day job was designing ornamental ironwork. There is variation in the spelling, with Mabberley and Maberley both about on the Web. Mabley is the correct version. 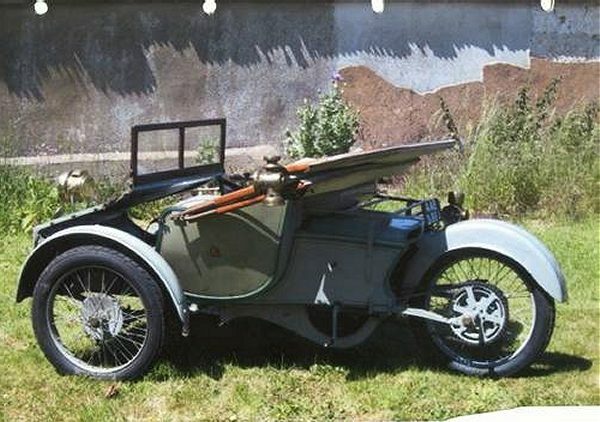 The Sunbeam had one wheel at the front, one at each side, and one at the rear; this is often described as a diamond configuration, but in fact the front and back wheels were not in line. 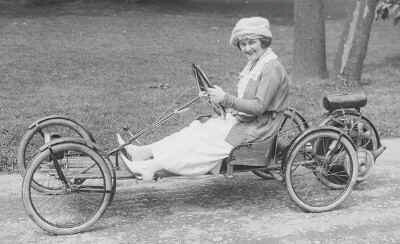 The layout was similiar to that of Starley's Coventry Rotary quadracycle. The car was powered by a single-cylinder 2.75 HP De Dion engine mounted next to the front wheel, but it did not drive this wheel at all. A belt from the engine ran backwards to a 2-speed gearbox and differential; chain drives ran from this to the two unsprung side wheels. The seating was as unorthodox as the wheel placement. Two people sat close together on the front seat, facing the side of the road; the driver sat behind them, steering with a tiller and facing the opposite side of the road. This all sounds very unnatural; the natural tendency would be to twist round to look in the direction in which you are going. This is especially a good idea if you are the driver. Note that extra seat backs have been added at the corners of this version to make the twisting a bit less uncomfortable. 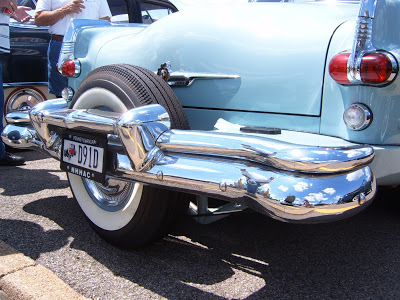 A small-diameter exhaust pipe goes round in an elegant semi-circle, then heads toward the rear. In the previous update I said 'Note the red-lined petrol tank mounted on the far side of the car' but it now appears it is a radiator header tank. Looking at the fins on the cylinder I assumed that the engine was air-cooled, but closer investigation shows that the cylinder head only is water-cooled and there is a four-row gilled-tube radiator mounted just above the engine. 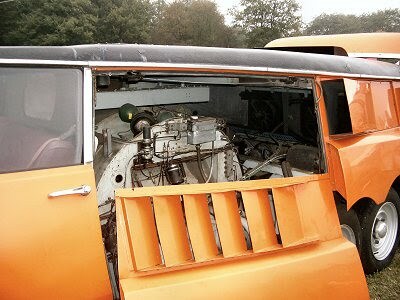 The petrol tank was somehow fitted in between the driver and the passsengers; for the time being the exact location remains enigmatic, but it must be reasonably high up for gravity feed to the carburettor. This is another Sunbeam-Mabley; the engine here appears to be wholly water-cooled. This machine was sold by auction at Sotheby's on 23rd October 1969. The auctioneer's blurb states that the engine is partly air-cooled and partly water-cooled, but this does not square with the appearance of the engine, which looks to be wholly water-jacketed. The blurb states that the engine power was 2.75 HP, from a 74mm bore and 76mm stroke; the capacity was 327cc and the inlet valve was automatic. It also states that ignition was by trembler coil, but that looks like a magneto on the front to me. Its price when new was stated as �130. The Museum staff have so far not been able to find out what it sold for in 1969. This is a contemporary picture of the Sunbeam-Mabley. No extra seat backs here. The engine here seems to have a water-cooled head and a finned cylinder barrel for air cooling. No radiator header tank is visible, and the radiator has six rows instead of four. No magneto is visible; I suspect the writer of the auctioneer's blurb mentioned above was working from this picture. 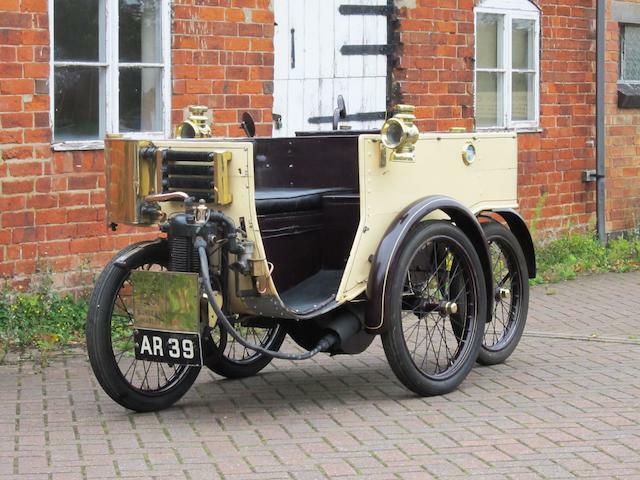 Remarkably the Sunbeam-Mabley had some success; several hundred were sold in 1901 and 1902 at �130 each. 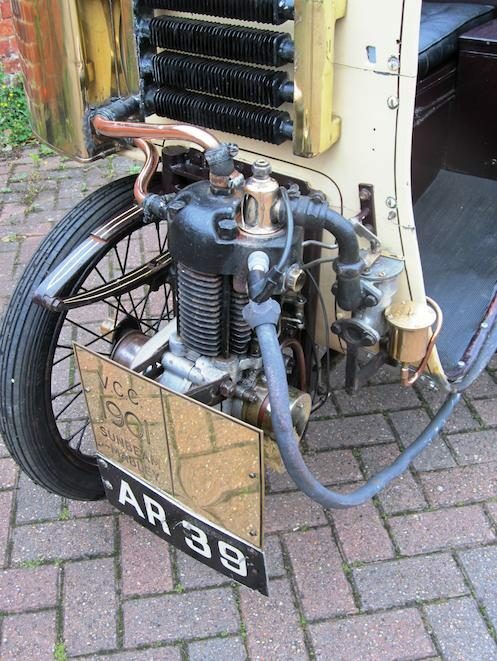 It was still in the Sunbeam catalogue in early 1904, offering a single cylinder 327 cc engine 74 x 76 mm to run at 1,800 rpm. Weight 4� cwt. (which is very light) The price then was �120. This Sunbeam-Mabley was sold at auction for �65,000 in November 2011, which presents a good advance on the initial purchase price of �130. The cylindrical silencer can be seen just ahead of the centre wheel. AR39 has successfully taken part in the London-Brighton veteran car run. It was this photograph that made it clear that the engine was partly water-cooled and partly air-cooled. It also shows that the tank at the front is a water header tank and not the petrol tank. On the top of the cylinder head, in a copper housing is an automatic inlet valve; it opened against a light spring on the induction stroke. Simple but not conducive to good engine breathing. 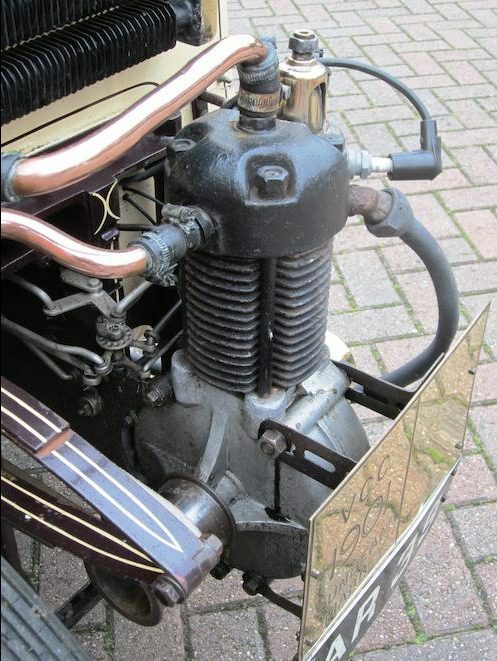 A black right-angle induction manifold connects it to the carburettor; immediately to the right is the polished copper float-chamber. Here the wide pulley on the engine crankshaft can be seen; the belt is not fitted. Just to the left of the cylinder barrel can be seen two control rods; presumably they work the throttle and choke on the carburettor. The engine arrangements look rather different here, but the photograph is not clear enough to make out any details. The date is unknown but must have been in the period 1901 - 1904. This remarkable vehicle certainly has four wheels, but it also has a pair of caterpillar tracks. It also has a complicated history. 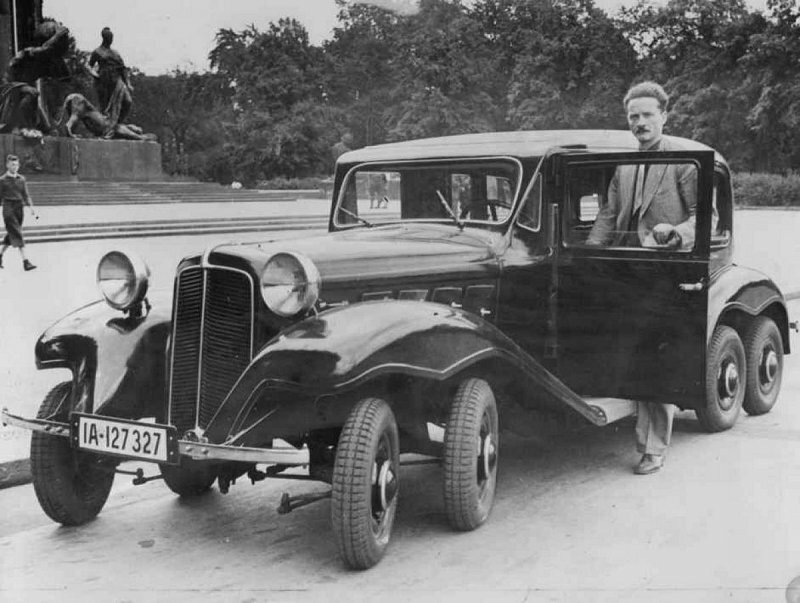 The vehicle was designed and constructed by the German engineer Joseph Vollmer, who was at the time co-owner of the German Automobile Construction Company (DAC). The manufacture of tanks was forbidden in the German Reich due to the Treaty of Versailles. To evade this, the the GHH (Gute Hoffnungs-H�tte) steelworks group, based in Oberhausen had acquired the Landsverk company in Landskrona, Sweden. Vehicles and engines were designed and then sold as complete factory drawings against future royalty payments. The FM30 had a 150 HP engine, weighed 11.5 tons and could exceed 45 mph (75 km/h) on the road using its wheels, and 20 mph (35 km/h) across country using its tracks. To convert to tracked operation, both sets of wheels were raised until the top of them were level with the tank deck. Perhaps predictably, the dual system was complex to manufacture and too fragile for military use. Tests took place in 1935-36, but the single example was laid aside. It has been preserved and can be seen in the Swedish Arsenalen Museum in Str�ngn�s. Their website is here. There is a very short Wikipedia page. This Swedish armoured car design resembled the German one just below in that it had four wheels in normal use, plus two spare wheels which were mounted so they contacted the ground in rough country and prevent the vehicle getting stuck; it's another case of 'is this a 4 or 6-wheeled vehicle'?. The four main wheels were driven and steered at each end. The wheels in the picture are hidden behind the pentagonal armour plates. The rear of the vehicle is towards the camera, and tyres contacting the road can be seen at each end- but the middle pentagonal plate has no tyre visible under it. The phrase 'rear of the vehicle' is a bit of a doubtful one in this case: the FM29 had a driver and controls at each end, allowing for some spectacularly rapid retreats. You may be worried that this armoured car appears to be equipped with a pair of torpedo tubes. In fact the two circular hatches cover the headlights; the headlights at the 'rear of the vehicle'. Only one example was ever completed; the design proved too big and heavy, and too expensive. Many thanks to Tulle R�nnmyr for bringing this vehicle to my attention. The FM29 demonstrates its ability to deal with a hump, though the spare wheels aren't actually doing anything at the moment. It also gives a very good view of the front and back driving positions. 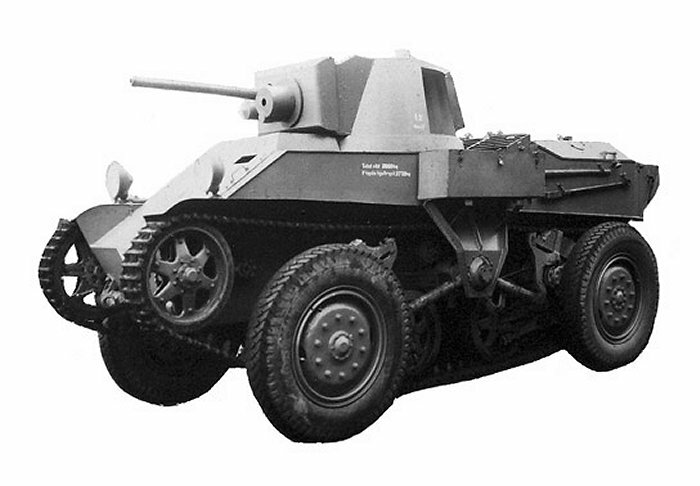 Between 1936 and 1943 the Wehrmacht was supplied with Einheits-PKW (German for 'standard passenger cars') in the three versions; light, medium and heavy. 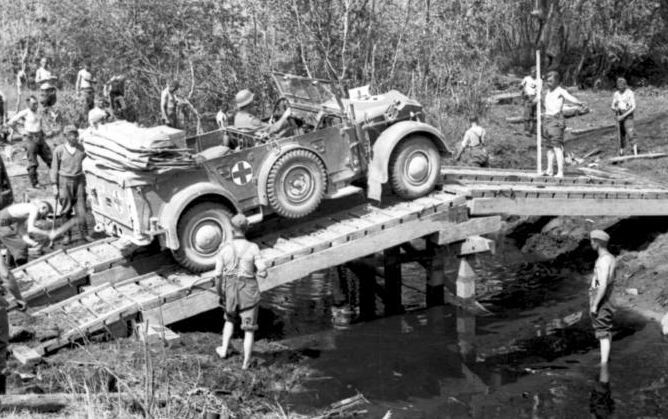 These vehicles were supposed to provide cross-country mobility. 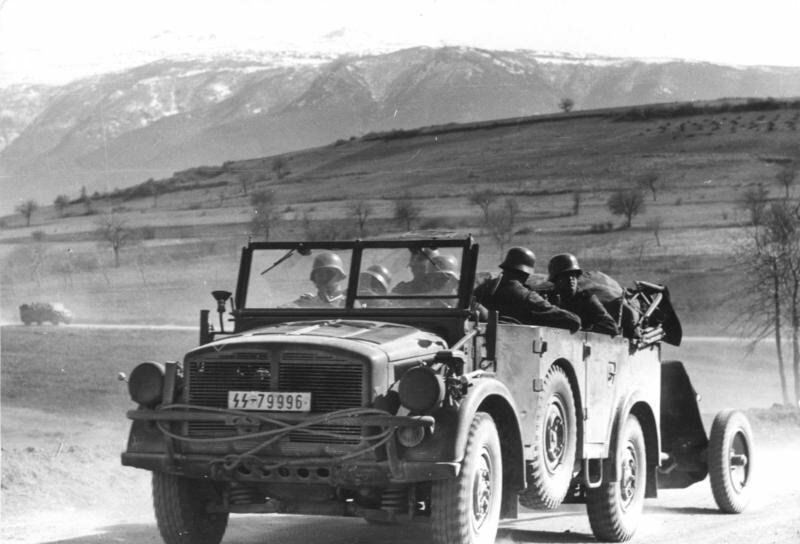 They proved too complicated and expensive, their place being taken by the Volkswagen Kubelwagon, which proved capable of dealing with rough terrain despite only having two-wheel drive. Shown here is the middle-weight version. On each side a spare wheel was mounted on a bearing, so it could rotate freely if it contacted the ground and so prevented the chassis grounding. While this feature seems rather ingenious, it must have failed to earn its keep as it was removed in 1940 to simpify the bodywork and make more room inside. So- is that four wheels or six? Many thanks to Bernd F and Pavel Panenka for drawing this machine to my attention. This is very much the same as the middle-weight version, though the spare wheels are recessed further into the bodywork. So- is that four wheels or six? Nobody's counting the two wheels on the gun being towed. 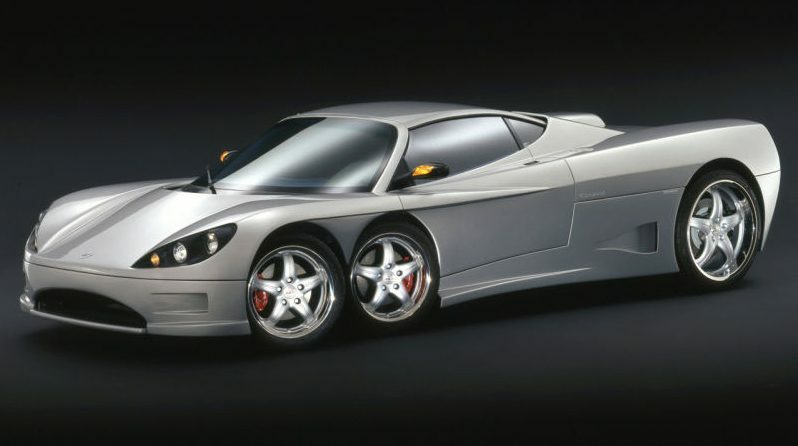 The Pininfarina-X project showcased its low-drag body design, with a drag coefficient of only 0.23, far superior to the ordinary cars of the time. Batista Pininfarina worked with aerodynamics expert Professor Alberto Morelli. 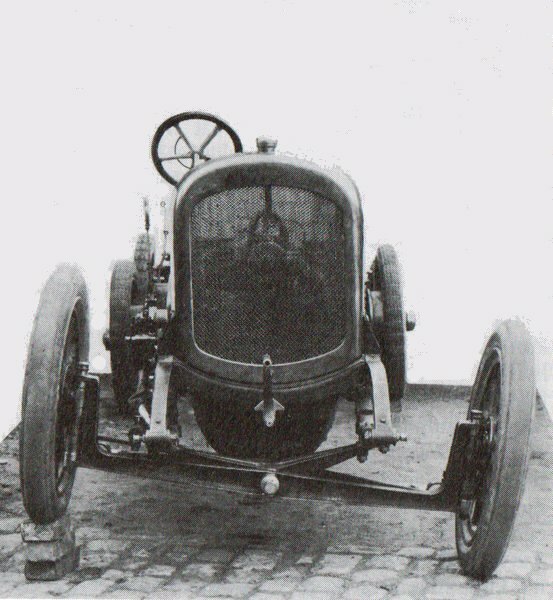 To achieve such low drag the front of the car had to be narrow, leading to this unorthodox layout with one wheel in front, two at the side, and one at the rear. The front wheel did the steering and the rear wheel all the driving. A 1089cc Fiat engine was installed at an angle in the rear of the car. This odd arrangement was made necessary by the rear three wheels being close together. This must have made for an assymetrical weight distribution and one wonders if that affected the handlng. The project was a successful technology demonstrator up to a point, but a single front wheel was never going to be acceptable in mainstream motoring. The car was eventually bought by a collector and still exists. You're not going to get a car with four conventionally-placed wheels on this page, unless there's something very funny about the wheels. I think this car qualifies; it has four square wheels. This is from a Mythbusters episode. Interestingly the jolting gets less as speed increases because the wheels are bouncing from one corner to the opposite one, the intermediate corner not touching the ground. There is a YouTube video, posted in 2016. It is slightly disturbing that this is far from a unique occurrence of square wheels. Typing 'square wheels' into YouTube produces scooters, bicycles, tricycles, tractors, motorbikes and skateboards, all with square wheels. Presumably the ultimate Perverse Wheel would be an equilateral triangle. The Phelps Tractor was an ingenious idea that failed to become popular. The steam-powered propelling section was a three-wheeled unit controlled by steering rods from behind. Presumably this was to reassure potential purchasers who were more used to driving horses and wanted no truck with new-fangled notions like steering wheels. The propelling unit could be coupled to a carriage (Combination 2) or a parcel wagon (Combination 3, with extra storage over the engine compartment) or any other suitable trailer unit. This included sledges. 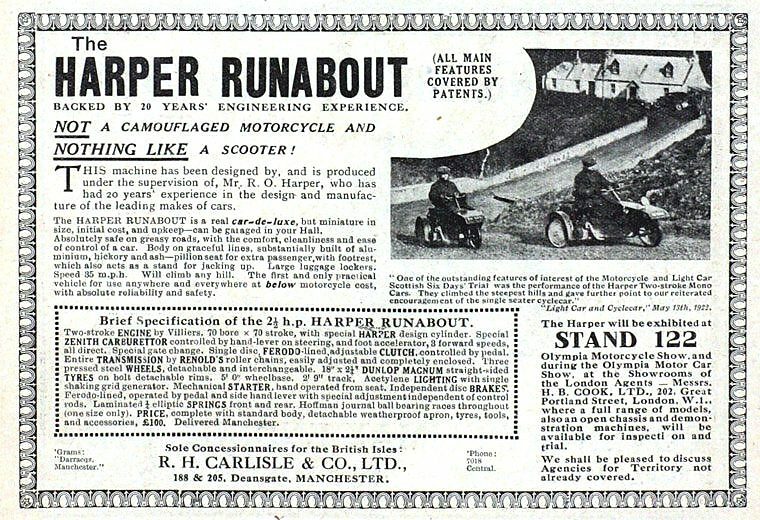 The advert at left describes how to steer, start, stop, and reverse, with the useful feature that the engine stops if the rods or reins are dropped or otherwise released entirely. It think the top version has a reasonable claim to be a 5-wheeled car; you couldn't drive the tractor unit around by itself. The claim of the lower version to be a 7-wheeled car is more dubious, as the trailer is essentially a separate vehicle. There seems to be much doubt as to whether this machine was actually built- there appear to be no photographs. I have grave doubts as to the practicality of fitting a 10-HP steam engine, complete with fuel and water tanks, in an enclosure the size of that shown in the top picture. Significantly, no chimney is shown to carry away the boiler exhaust gases, and there is no sign of an air-cooled condenser, which would be a sizable item. 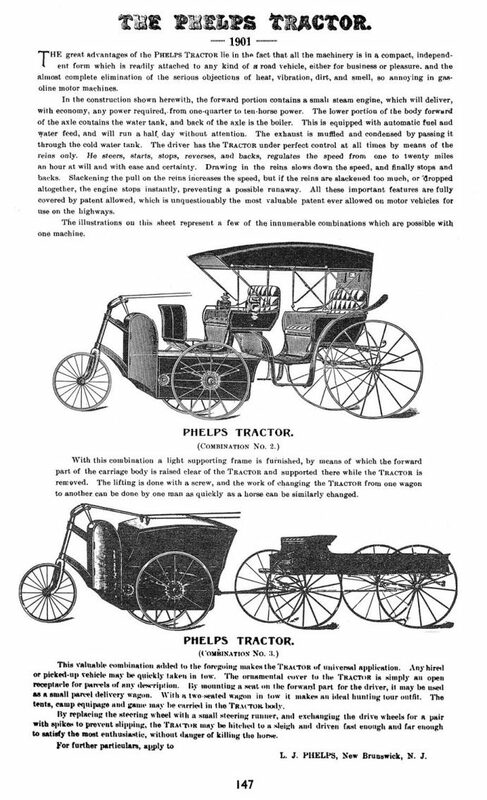 The Phelps Tractor was not unique in its rein-control. 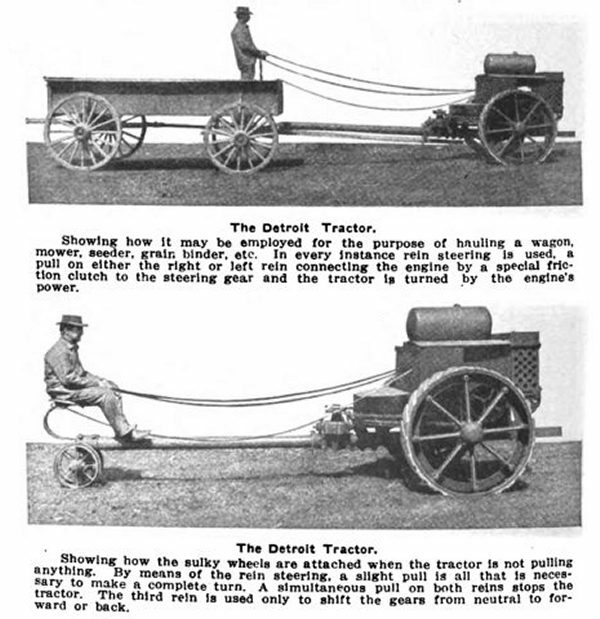 The Detroit Tractor (which judging by these photographs really was built) had a more practical internal-combustion engine. It is not clear why the towing pole was so long- it may have been something to do with using unmodified horse-drawn ploughs, etc. I appreciate that neither of these configurations qualify as a 5-wheeled car, though they might as 6-wheeled and 4-wheeled. But I thought it best to show them here for comparison with the Phelps tractor just above. The Detroit Tractor Company was an overshoot of Baker & Baker of Royal Oak, Michigan. It was set up in March 1913 to build Baker tractors, but a few years later moved to Lafayette, Indiana where this machine was built. It was described as 'a line-drive tractor of the universal frame design'. Presumably 'line-drive' refers to the rein-control system, but I don't understand about the 'universal frame design'. 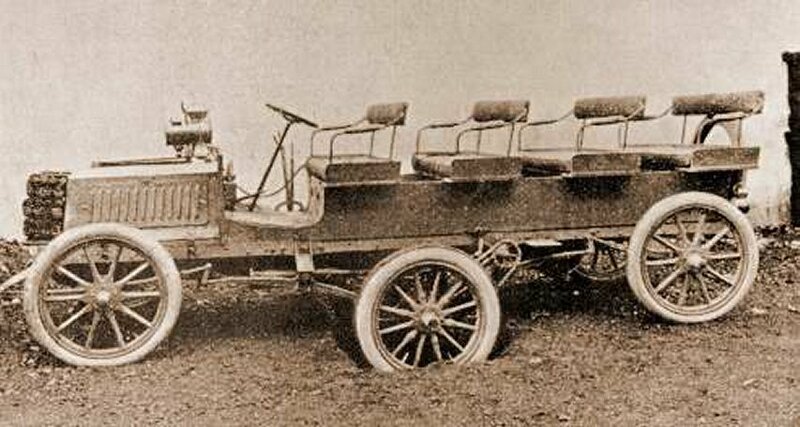 The Smith Flyer was a four-wheel buckboard with a Smith Motor-wheel attached at the back. It seems to have been intended for fun rather than serious transport. Nonetheless, I feel obliged to point an obvious snag. The fifth wheel is clearly hinged to the back of the vehicle, to allow it follow irregularities in the road. Thus only the weight of engine and one wheel is available for adhesion. The traction abilities must have diabolical. It is often cited as the cheapest car ever sold, but that means stretching the definition of 'car' to breaking point. It was no competition for the Model-T Ford, which could be had for a few hundred dollars more. The caption is informative. However, in the list of its desirable features (I like the 'natural woodwork') there is no mention of... brakes. There is no mention of suspension either; there wasn't any beyond the flexing of the chassis. It does however have front and rear mudguards. I marvel at the idea of raising the whole engine and wheel to declutch; this is less practical with a V8. There is no mention of a throttle control, which would have required a Bowden cable; it says 'Control is under the thumb on the steering wheel', which I take to mean an ignition cutout switch. And there certainly wasn't a gearbox. Sorry about the moire. Nothing to be done at this stage. This magnificent photograph captures a Smith Flyer superbly. The Smith Motor-wheel with its distinctive two mounting horns, has in this case a belt-driven 4-blade cooling fan. The diagonal wire attached to the engine is presumably the 'clutch control' for raising the engine and wheel off the road. Pictured at what appears to be a tractor rally. 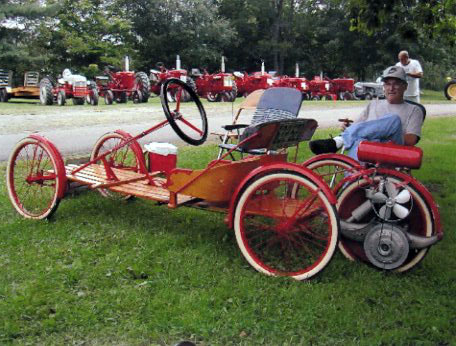 This restored Flyer has a 5-blade belt-driven cooling fan. 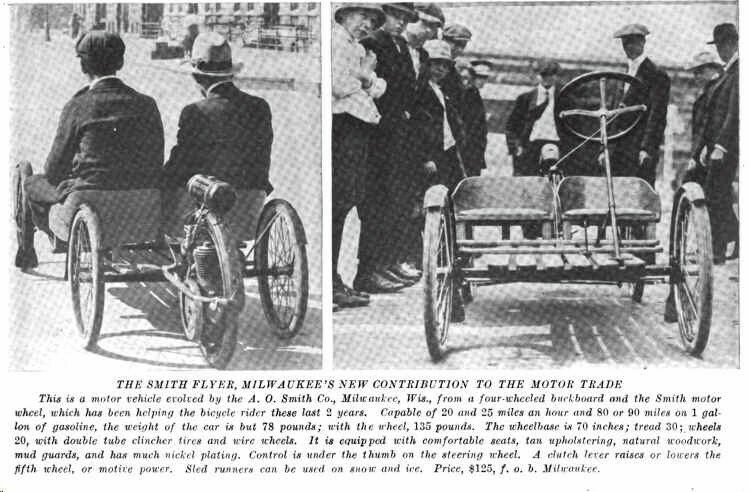 This shows the conventional application of the Smith Motor Wheel; you bolted it to the side of your bicycle converting it into a sort of tricycle. The Smith Motor Wheel first appeared in 1914. The Smith Motor Wheel was an ingenious design. The disc wheel was driven directly from the cam-shaft, which was geared down 8:1 to give a suitable drive ratio. However the camshaft of a 4-stroke engine must rotate at half engine-speed; Smith got round this by having four lobes rather than one on each cam. 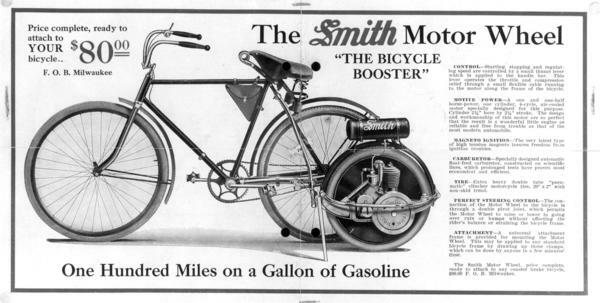 This ingenious idea was borrowed from the Wall Motor Wheel, invented in England in 1910, of which Smith had bought the US manufacturing rights. The Wall Motor Wheel used a 4:1 reduction ratio and a two-lobed exhaust cam; the inlet valve was automatic. The huge barge-like cars produced in the USA in the 50's were hard to park in spaces of limited size. Here is one attempted solution; a fifth wheel that lefts the normal rear wheels off the road and allows the back of the car to go sideways. It could be argued that the car was a three-wheeler during this operation, as only three wheels were actually touching the road. A hydraulic cylinder lowered the fifth wheel, which was then rotated by a friction roller driven from the rear axle. For a long time nothing was currently known beyond the existence of this photograph. It can now be revealed that this Cadillac is using the Park-Car concept invented by Brooks Walker in the 1930s. US patent 2,139,341 was applied for in 1932 but only granted in 1938. Now you may object to carrying around the weight of an extra wheel just to help with parking. But the beauty of the concept is that it doubles as the spare wheel, and the only extra weight is that of the raise/lower mechanism. There is a video of the fifth wheel in operation on YouTube. The fifth wheel 22 swings down on a radius arm 25, actuated by the hydraulic cylinder 31. The big spring 38 looks as if it is intended to retract the fifth wheel if the hydraulics fail. The fifth wheel is driven by friction roller held against its tread; this is driven by the chain 45, from the shaft 43. This shaft is driven by another friction roller 41 bearing on the rear tyre 40. There are two friction rollers here that need to have a good grip on their respective tyres. How well is that going to work in the wet? The friction roller 41 bears not on the tread of its tyre but on its sidewall. Tyre sidewalls are not designed for that sort of duty and would quickly wear and become dangerous- on the inside sidewall which is hard to inspect. Finally, what about the differential? Once both rear wheels are of the ground, trying to apply power through tyre 40 is just going to make the opposite rear wheel spin uselessly. This installation takes up most of the room in the boot (trunk) and apparently the petrol tank has also had to be moved- quite a major rebuild. This photograph shows chain drive to the fifth wheel, alleged taken from the propellor shaft, though it is far from clear exactly how that worked. Not to be pedantic, but I can only see one hydraulic cylinder here, at bottom right. The other tubular things are parts of the bracket holding the fifth wheel. Multiple-exposure photography demonstrates the parking process. The car on the left can get into a much smaller parking space by swinging its rear in. 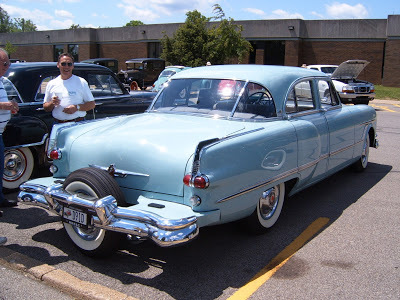 This 1953 Packard Cavalier was converted by Brooks Walker and used as his personal transportation; it still survives. This time the fifth wheel lives outside the boot, (trunk) which leaves the luggage space intact. Presumably moving the petrol tank was also not necessary. Definitely a more practical proposition. According to the latest information I can find, the Packard is currently owned by William Swaney of Pennsylvania, who bought it in December 2005. The hydraulic system has been rebuilt, and is fully operational, so the car can go round in complete circles if the owner so desires. Left: The Brooks Walker idea reborn. This modification was done in Egypt. The car is an old-style Renault 5. I use to have a Renault 5TS, and it was a good and fast car. But I was tempted away by the Peugeot 205 GTi; (1.6 litre version) lovely car, wish I still had it. 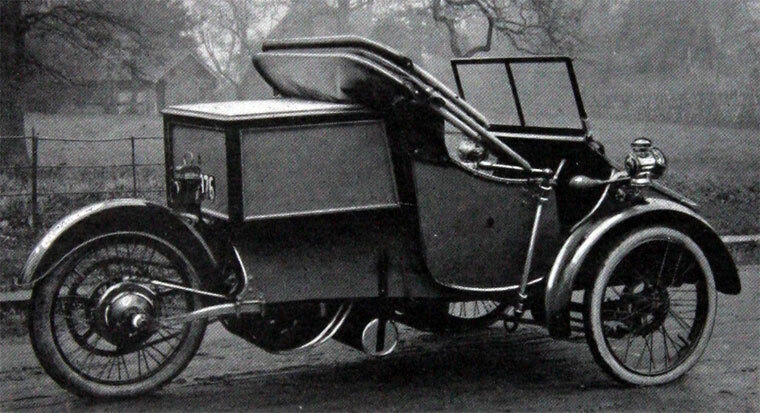 The more fastidious of readers may be complaining at this point that the Brooks Walker fifth-wheel and its Egyptian successor may be using a bright idea, but it does not have all five wheels on the ground at the same time, and so does not count as a five-wheeled car any more than does a four-wheel car with a spare wheel in the boot. See if I care. Be aware that the term 'fifth wheel' is often used to describe the horizontal turntable on which an articulated trailer pivots. See Wikipedia. There is also the idiom "About as much use as a fifth wheel." which makes no sense because there are times when a spare wheel really comes in handy. 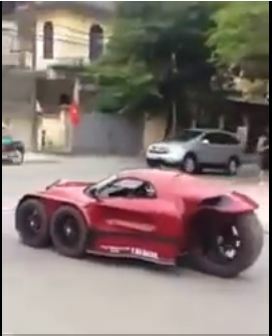 Nothing is known about this vehicle except the video on YouTube, entitled '5 wheel super-car of the man Vietnam', which presumably at least locates the country. At any rate they drive on the right. If anyone knows any more I would be glad to hear it. There is a video of the car driving off at YouTube. It sounds like it's powered by a motorcycle engine. The back wheel looks like the rear wheel from a heavy motorcycle to me. Early cars were naturally based on horse-drawn vehicles, but this design takes that philosophy further than most. The horses are here replaced by a 4-wheel tractor unit. This remarkable vehicle has now been identified as the landau of Grand Duke Alexis of Russia, drawn by a Heilmann electric tractor circa 1898. That is the same Heilmann who produced a remarkable steam-electric locomotive. 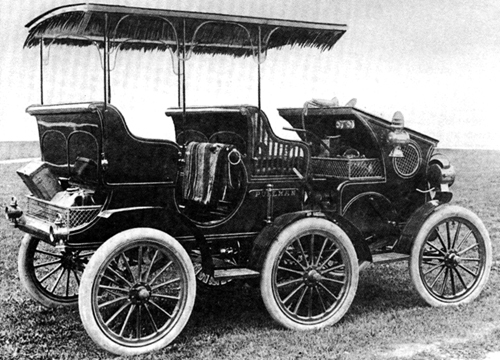 The Pullman marque was manufactured in Pennsylvania by the York Motor Car Company from 1905 to 1917. 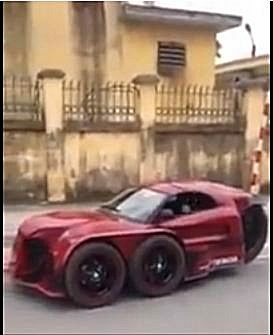 Here's one way to arrange six wheels on a car. This wheel configuration is very rare, and was thought to be unique until the Lorraine Dietrich car (below) was discovered. 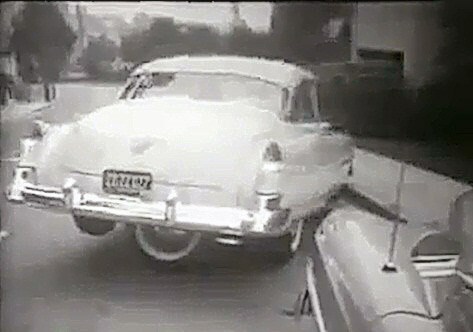 When the middle wheels encountered a high spot in the road, the car had an unhappy tendency to rock back and forwards. The Pullman car was not a success. It crashed into a telegraph pole within a year of its construction, very probably due to instability in the steering behaviour. Its parts were used in more conventional cars. The year of building is usually given as 1903, which seems to indicate it was prototype built before Pullman went into mass production in 1905. Pullman went bankrupt and ceased operations in 1917. Charles T. Pratt of Frankfort, New York, was like Reeves, an industrialist, owning the Pratt Chuck Works. He built this 6-wheeled one-off, with a 'triple phaeton' body. "The wheels are mounted on lengthwise members, which are pivoted to the rear springs in each side. 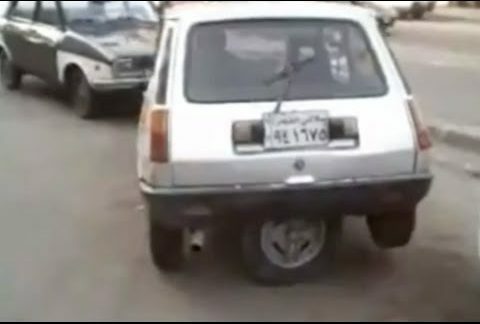 By this mode of support much less shock is transmitted to the body of the car than is ordinarily the case, since inequalities in the road, causing a rise or depression of one of the four wheels, will raise or depress the body spring by only half that amount, provided the other wheel on the same side remains on the level." 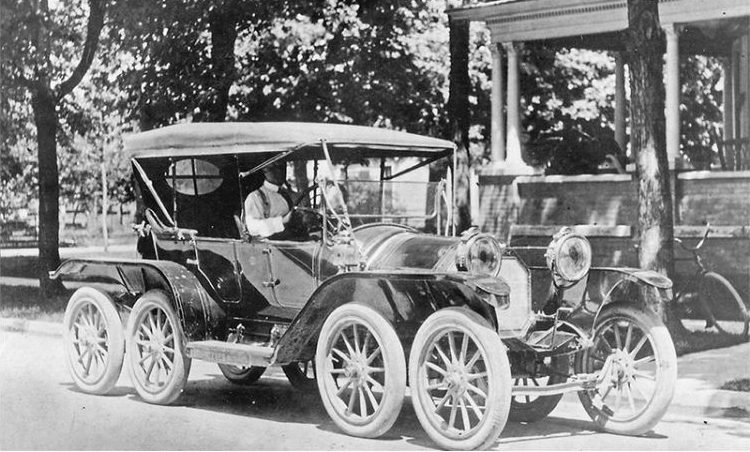 Pratt told the press that he built the car only for his own use, but nontheless he took out two patents: US 842,245 - (Running Gear for Automobiles) in January 1907, and US 888,737 - (Automobile Running-Gear) in May 1908. 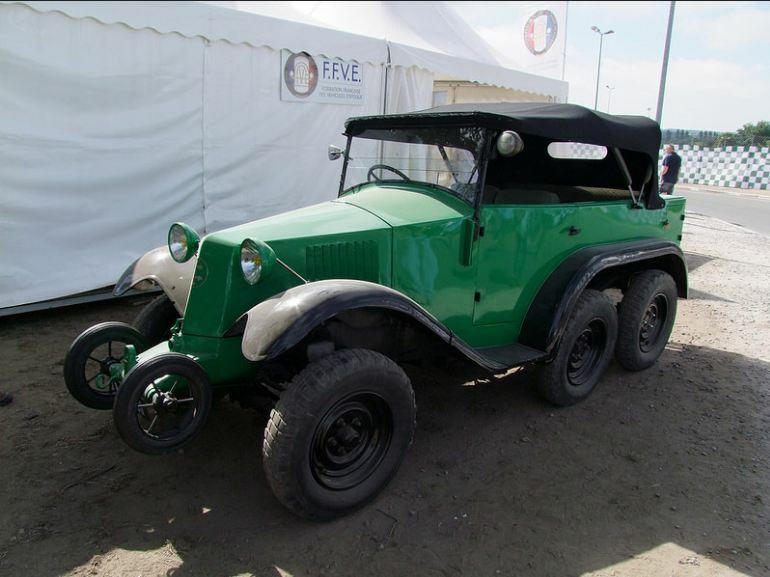 Unlike the Sextoauto, this six-wheeler apparently used both forward and centre axles for steering and the rear axle for propulsion. Since the 'centre' wheel is well towards the back this does not sound like a very practical proposition, but that is what is shown in US 842,245. Searching for Pratt cars will only bring up George and Bill Pratt, who began car production in 1909. There appears to be no connection. 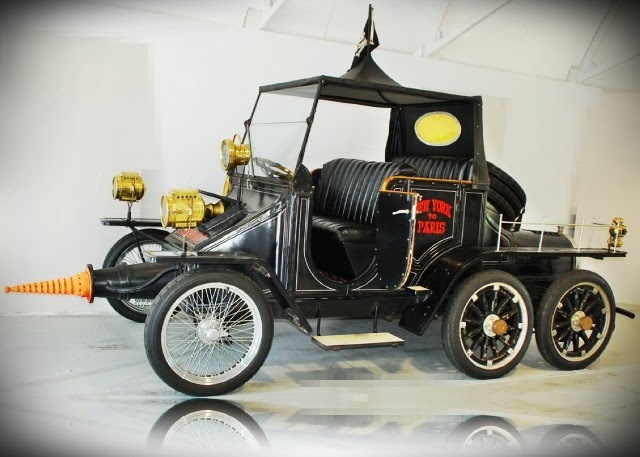 This six-wheeled car was produced by the Soci�t� Lorraine Dietrich apparently in 1908, though one source states 1903/4. The makers described it as an 'omnibus'. 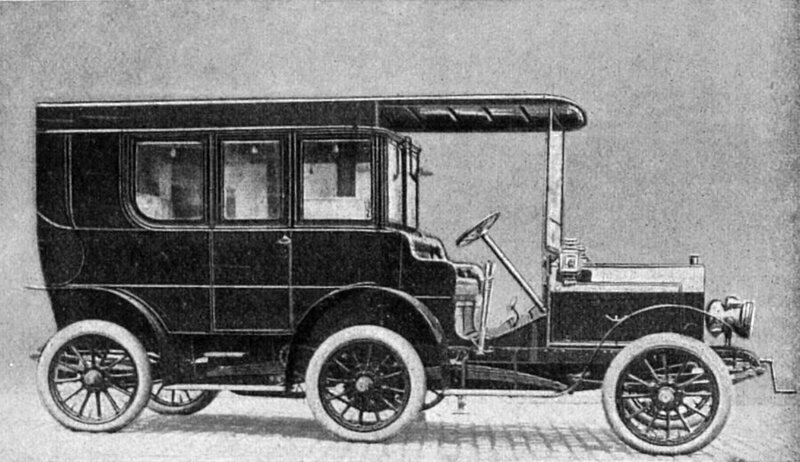 The rear section was stated to be a fourgon or baggage-van. It had a 40 HP engine and a maximum speed of 55 to 62 mph (90-100 km/hr) and according to some accounts driven by the four rear wheels. This needs confirmation- the chain drive to the centre wheels can be seen just to the left of the tyre, but not so any chains to the rear axle. However if you had rear wheels, surely you would drive them? Other accounts suggest that the rear wheels were steerable, but not driven. The first and third axles could slide axially, which was claimed to allow a very small turning-circle, equivalent to that of a car half the length. It sounds like that might make for some interesting handling. However contemporary writers enquired anxiously about the true size of its turning circle. Just above the driver's position, a speaking tube can be seen. This allowed the passengers to give the driver instructions without the inconvenience of opening a window. Thanks to Pavel Panenko for bringing this vehicle to my attention. 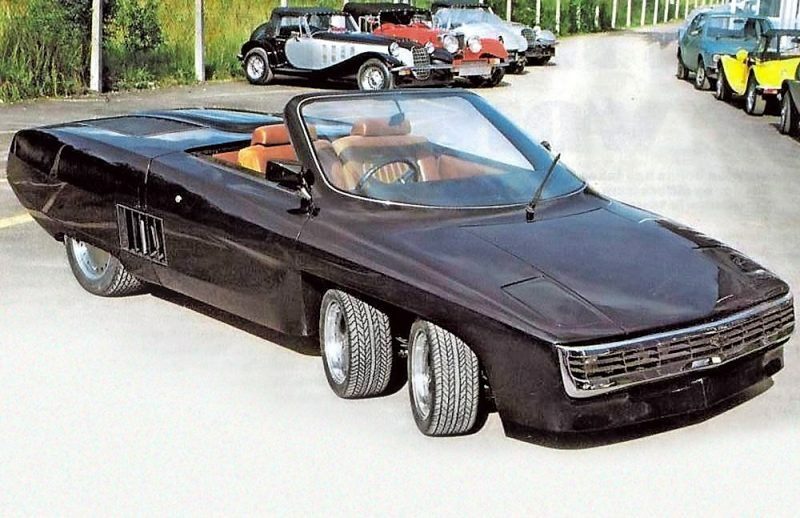 Another view of the Lorraine Dietrich six-wheeled car. It was commissioned by Baron Herrmann von Eckhardstein, [1864-1933] who was first secretary at the German embassy in London from 1891 to 1901. Though never the ambassador, as the first secretary he performed most of the functions of one. The car boasted a silver sink with hot and cold running water, electric lighting and heating, and a dashboard fitted with every imaginable instrument. The fourgon actually held a fully equipped kitchen in which Emil, the chef, prepared gourmet meals. Entry to this kitchen was naturally via a tradesman's entrance at the rear of the car. The car is said to have had a wheelbase of 3.80 metres; this is presumably the distance between adjacent axles, rather than the overall wheelbase. 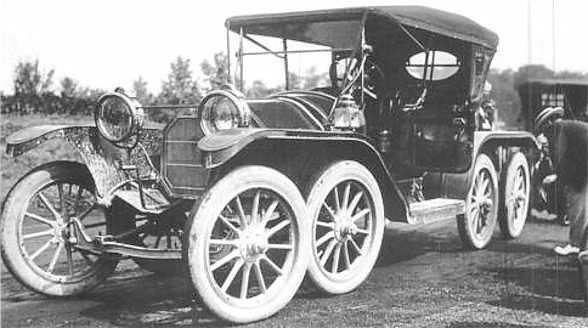 The six-wheel suspension was based on a patent owned by Turcat-M�ry, motor manufacturers from 1899 until 1928. This diagram of the six-wheel arrangement was published in a book in 1910. There are four linked leaf-springs on each side. The inner pair of springs pivot on the chassis at their centres. The sprocket for the chain drive is shown as a circle just to the right of the centre wheel; the chain is not shown. The six-wheeled car appears to have been preceded by this unconventional six-wheel lorry.This is one of the many Lorraine-Dietrich lorries that brought supplies to the 400,000 troops engaged in the Grandes Southwestern maneuvers in France in 1907. The four leaf springs visible are arranged as in the diagram above; in this case the driving chain sprocket is ahead of the centre axle. No drive chain to the rear wheel is visble. The centre wheels are bigger than the front and rear, and their tyres are bigger too, supporting the idea that only the centre wheels were driven. Also, different size wheels at the back would have required a different gear ratio to drive them. Add to this that if the rear wheels HAD to be steerable, to get an acceptable turning radius with the axle layout, applying power to them as well is going to give you all the difficulties of front-wheel drive technology- specifically a need for constant-velocity joints. Perhaps this is why the idea did not thrive- it limits you to just driving the centre axle, which is not going to give good traction. 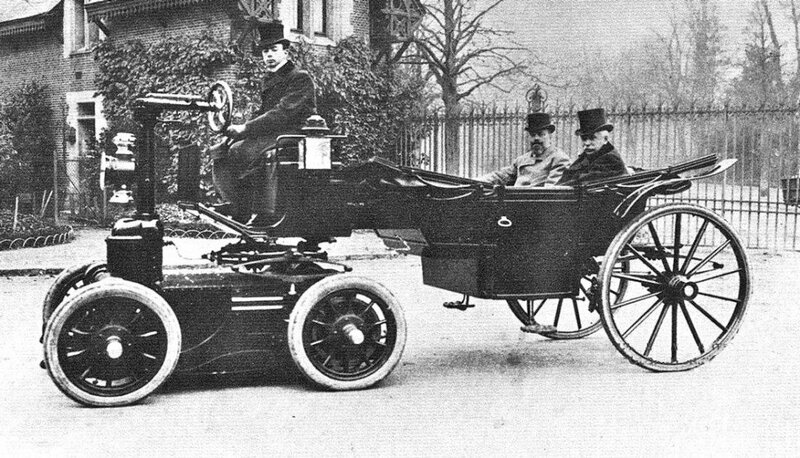 This six-wheel prototype was built by Turcat-M�ry in 1905. The patent involved was actually granted to Charles Lindecker of Briancon in France. Presumably Turcat-M�ry had bought the patent or taken out a licence to exploit it. This photograph shows the middle axle in a hole; note how the inner ends of the springs on the front and rear axles have been raised, reducing the load on them. The patent shows four methods of interconnecting the suspension of the three axles so that they will take equal shares of the load even if the ground is uneven; all are the same in principle but the fourth method, shown here, is the simplest mechanically, and the one used by Turcat-Mery and Lorraine Dietrich. Here the springs 4 do double duty as balance levers, transferring loads to and from the front and rear axles; they are pivoted on the chassis at their centres, indicated by two small circles. The centre axle is located by the radius arm 9; when the centre axle encounters a hole, it tends to sink, which causes springs 4 to swivel on their pivots and raise the inner ends of springs 3 by means of the little links. This reduces the load on the front and rear axles. The load distribution could be changed by varying the lengths of the suspension components. 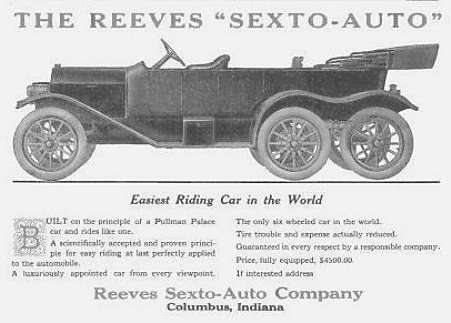 The Reeves Sexto-Auto actually came after the Reeves Octo-Auto, described below. 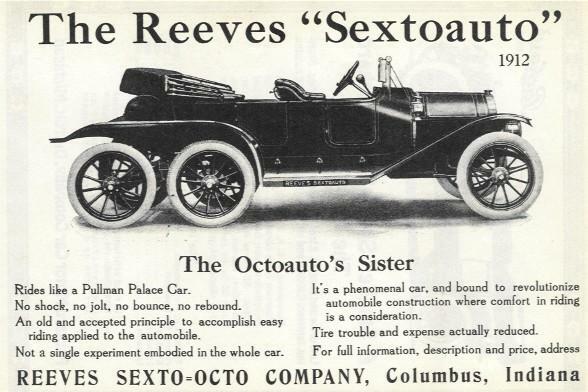 Faced with no orders at all for the Octo-Auto, Reeves claimed he could "Get as good results with six wheels as with eight" which rather invites the question of why he used eight in the first place. The Sexto-Auto involved rather more rebuilding than just removing the Octo-Auto's front axle, as the axle behind it has been moved forward to a position under the radiator. I am very doubtful if 'Tire trouble and expense actually reduced' was a realistic claim. The only Sexto-Auto ever built. It's all very well claiming that there is 'No shock, no jolt, no rebound', but how is that actually accomplished? Even if we accept that four wheels at the back give a much superior ride, the front two wheels are entirely conventional and so you would presumably get the usual amount of shock, jolt, and rebound from them. 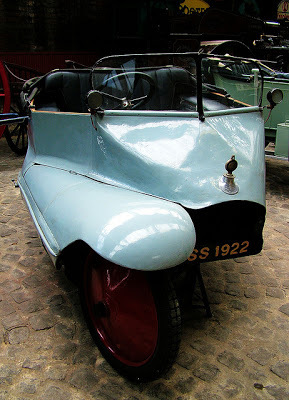 This Norwegian car was a one of two six-wheelers built in the years 1916-1917 by Hans Clarin Hovind Mustad, one of the earliest automotive pioneers in Norway. The front wheels steered, the middle wheels were both steered and driven, and the rear wheels simply driven. This car is supposed to be the first to be fitted with directional headlights swivelled by the steering, though it is not mentioned on the Wikipedia page. 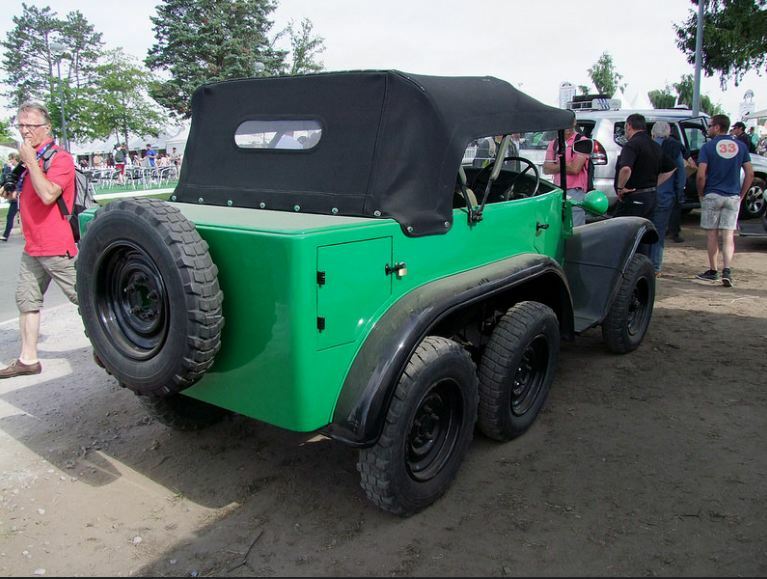 The wheelbase between the front and rear axles was 4.37 m and the weight was about of 3 tons. One of these cars is said to be in the Norwegian Museum of Science and Industry in Oslo, though it appears not to be viewable on their website. Yes, it can deal with three bricks. The Clarin-Mustad shamelessly displays its front beam axle. 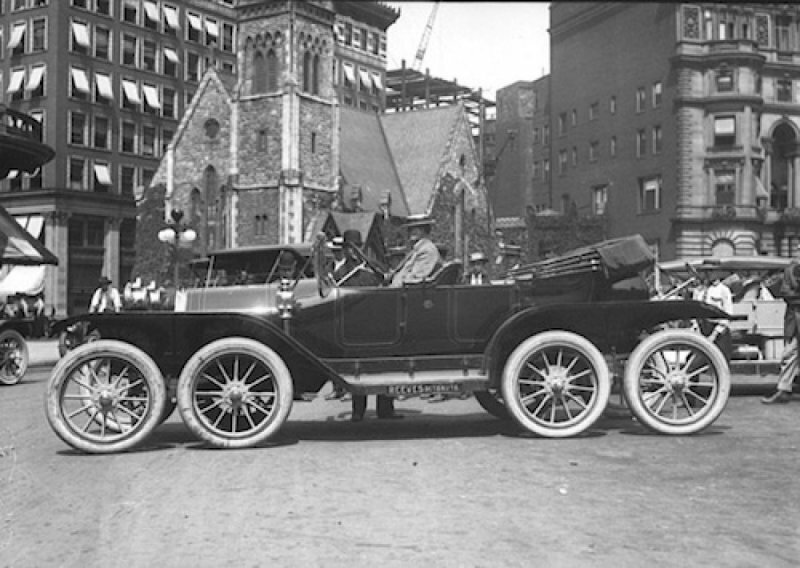 Such axles were common in early cars because of their simplicity, but the disadvantages are the lack of independent wheel movement and the high unsprung weight as the whole axle is unsprung. 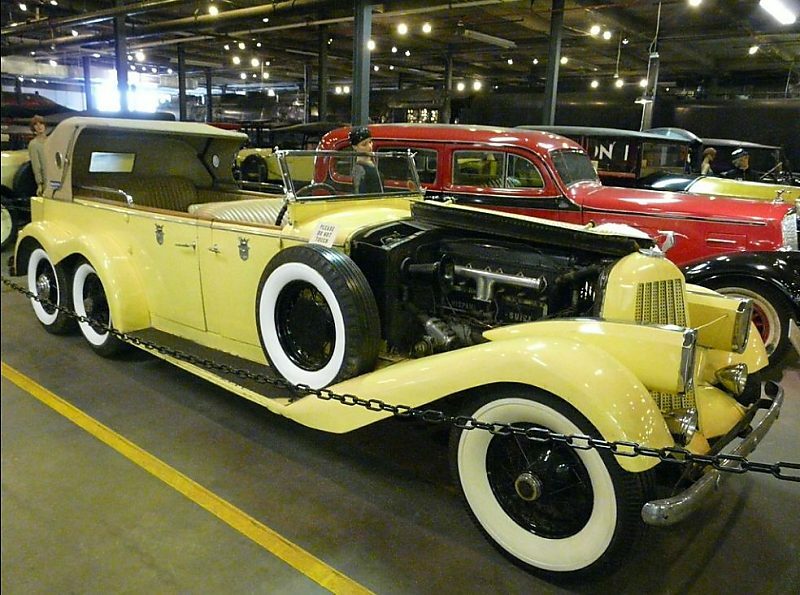 Based on the standard H6 Hispano-Suiza, this unique car was built for Constantine I, the King of Greece. Regrettably he had to abdicate in 1922 before taking delivery, and it was bought by the film director D. W. Griffith for $35,000. It appeared in the 1933 film "My Lips Betray" and some war films. It is now at the Forney Museum in Denver. The car is believed to have been built in Barcelona, and the body designed and built by Leon Rubay. The H6 in general has a Wikipedia page. The GAZ-21 6x6 was a Russian off-road prototype based on the GAZ-21 civilian saloon car. Very little information is available. 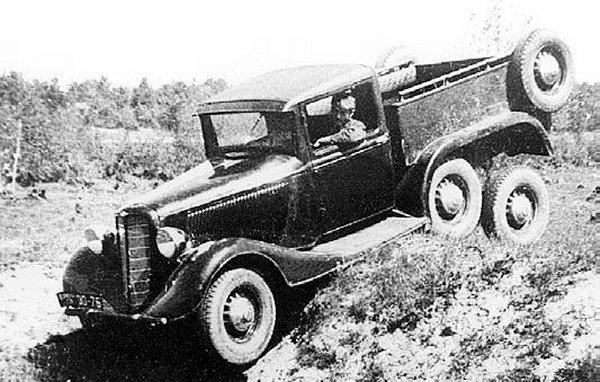 Referring to Wikipedia's List of GAZ vehicles we also find the GAZ-AAA - 6x4 2-ton truck, produced from 1934 to 1943. 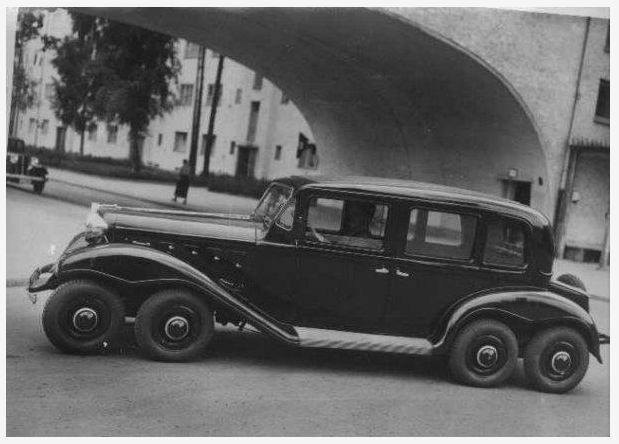 It was a three axle version of the GAZ-AA. The Mercedes-Benz G4 Type-W31 was a six-wheeled staff/command car built for the Wehrmacht in 1934, designed to cope with off-road conditions. Only 57 were built, of which only three completely original specimens are known to exist, one of them belonging to the Spanish royal family. All versions had eight-cylinder inline engine, driving the rear four wheels through self-locking differentials. 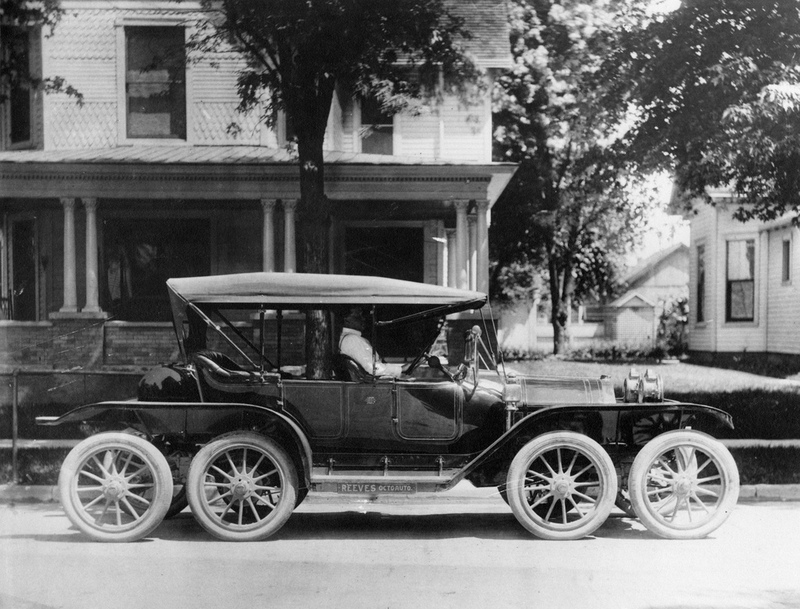 The rear wheels were attached to two rigid axles suspended by semi-elliptic leaf springs. The first three years of production had 5018 cc engines delivering 100 HP. Later engine capacity was increased to 5252 cc and then 5401 cc. This car has a Wikipedia page. Thanks to John Bevan for drawing this car to my attention. It should be simple enough to say how many wheels a vehicle has; and then you come across something like this. Does this count as six wheels or eight? 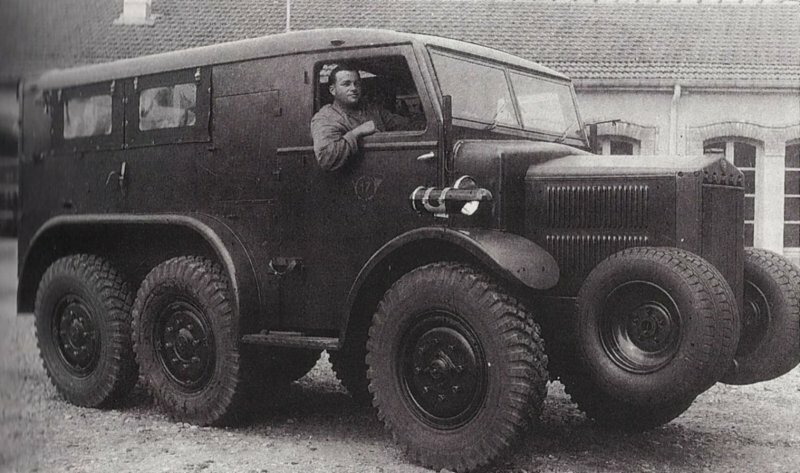 This vehicle is a VLTT (Voiture de Liason Tout Terraine) Lorraine 72, built under licence from Tatra by Lorraine-Dietrich for the French forces. 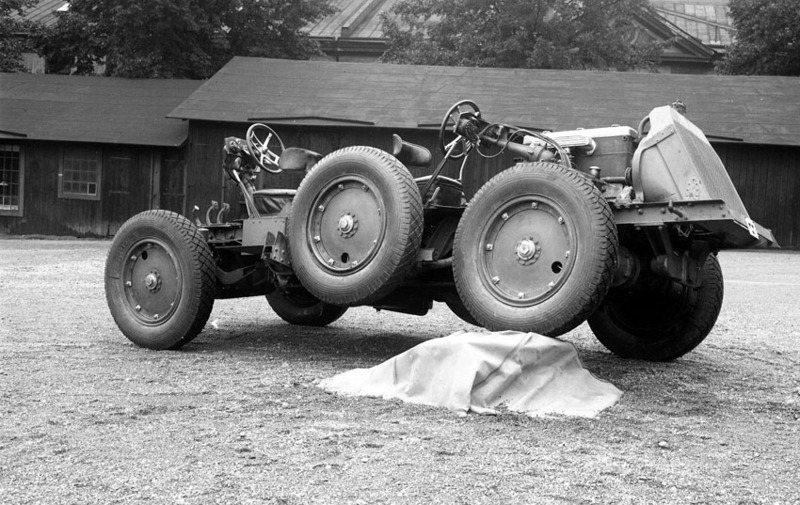 Images of this vehicle and others with the same chin-mounted axle are not hard to find if you know what you are looking for, but nonetheless none of the sources examined by the Museum staff even mention the very obvious extra wheels. It appears the idea is to make crossing ditches easier, as the extra wheels would help the front of the car to rise up the far side of the ditch. Presumably the two chin wheels were not powered, as they have no tread on; they are purely to stop the vehicle burying its nose in the ground. There also appears to be no room under the extended starting-handle for any drive mechanism. 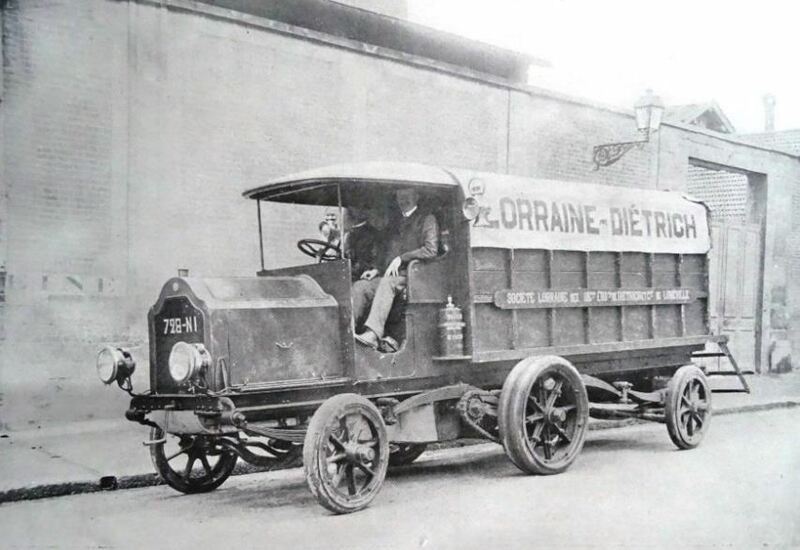 We have met the Lorraine-Dietrich company before, making six-wheeled lorries. See 1908 above. At least one VLTT 72 has been preserved; location and date of photo not currently known. The rear of the preserved VLTT 72. This vehicle, a fast troop transporter, was also built under licence from Tatra. Testing began in 1934 and the VDP 24 was issued to the services in 1937. Now there are four wheels on the chin axle, much more heavily constructed. So is that six wheels or ten? Here the chin wheels are treaded. It is not currently known if they were powered. The weight was 3.78 tonnes loaded and 2.72 tonnes empty. Length was 4.84m and height 2.08m. Ithad a four-cylinder engine of 4710 cc giving 55 HP and a maximum speed of 65 km/hr. It could carry ten men in total. It had no built-in armament but two hatches in the roof allowed for possible mounting of AA guns. VDP srands for 'Voiture de Dragons Port�s' which Google translate renders as 'Car of dragons worn'; this is unhelpful. I think it means 'car for mechanised dragoons'. The Lorraine 28 radio truck was a variation on the VDP 24. Here is one taking part in a parade in Paris in the ominous year of 1938. Note white-wall tyres on both the big and the little wheels. An inherent problem with this idea is the need to carry around two sizes of spare wheel. 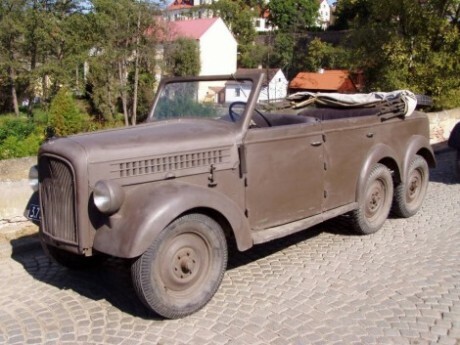 This military vehicle, the Skoda 903 (page in Czech) was developed from the Skoda Superb. (1934-1949) for the Czech Army. Three were built initially; a later version was built in 1939, totalling 42 vehicles.. The Skoda plant at Mlad� Boleslav is the largest production plant in the Czech Republic. This Russian military prototype, the GAZ-AAAA, had six normal wheels plus two more just behind the front pair. Images of this vehicle are very rare, but there is a YouTube video that shows the GAZ-AAAA in action for a few seconds around 38:35, and this image is taken from there. Presumably the extra two wheels are spares; those carried on the middle and heavy Einheits-PKW did double-duty as while they did not normally contact the road, they stopped the vehicle grounding on humps. These extra wheels are close behind the front pair and it is hard to see how they could have fulfilled an anti-grounding function. Referring to Wikipedia's List of GAZ vehicles it appears that only one prototype was built. This Laffly S35T artillery tractor also challenges definition. Do you call this six wheels or ten? It has six normal wheels, two little wheels on the chin like the Lorrain vehicles- plus another two little wheels between the front and middle main axles, presumably to stop the chassis grounding on bumps. 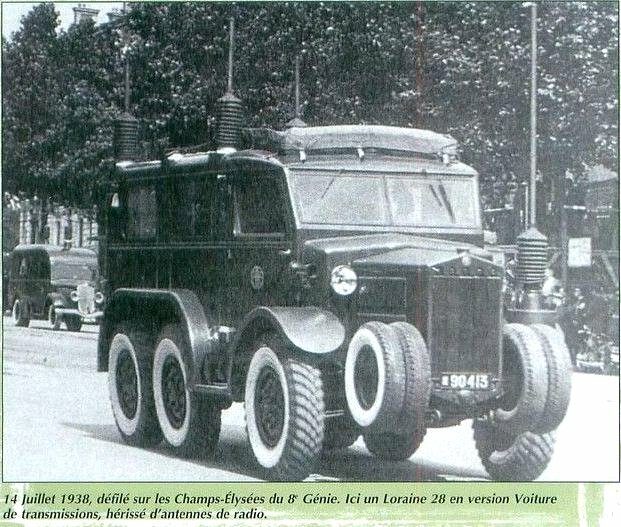 The first vehicles were delivered to the French army in 1937. All six of the main wheels were driven, but only the front two steered. The Laffly Company, founded in 1912, were major manufacturers of of heavy vehicles like trucks and buses in the 1920s and 1930s. 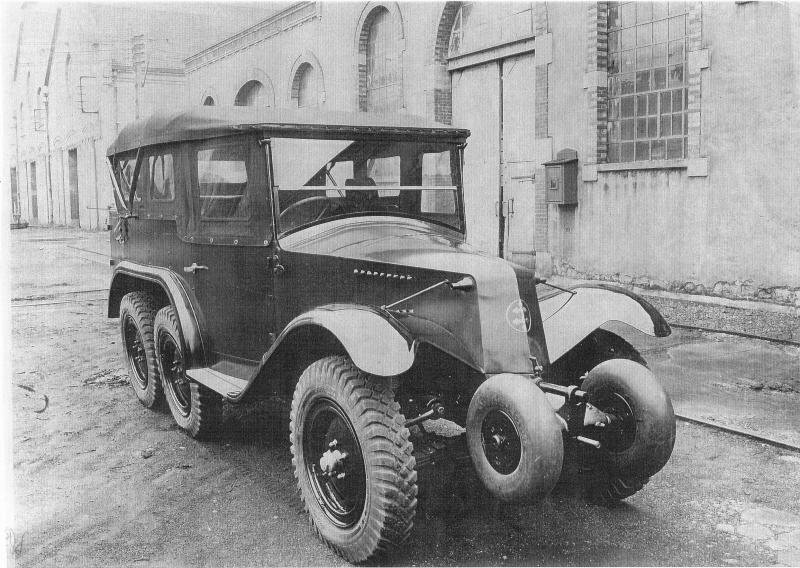 Laffly made other military vehicles with one or two extra little-wheel axles, such as the S15 and the W15 TCC. This picture of a Laffly S35T demonstrates that there were four wheels on the chin axle. So, do you call this six wheels or twelve? I am assuming the axle under the cab carries only two little wheels because of restricted space. The little wheels had no suspension, but were rigidly attached. This Laffly S35T is still in the hands of the French- note the caps on the men. After the fall of France they were used by the Germans. The main wheels are here fitted with snow chains. Since it's not winter (the men are in their shirt-sleeves) I wonder if there some traction problems. Another approach to putting six wheels on your car is double tyres on the rear axle. 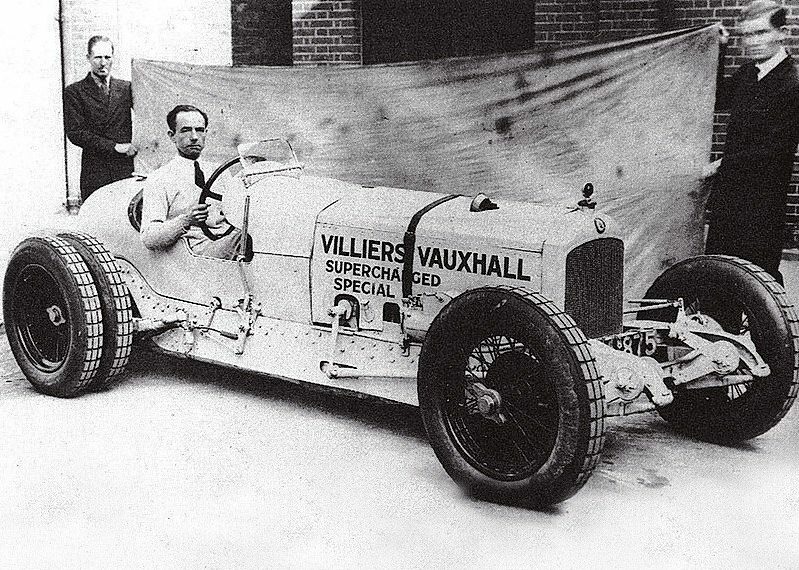 The Vauxhall Villiers racing car had a 3000cc 300 HP supercharged engine, and dual rear wheels were tried by driver and entrepreneur Raymond Mays in the hope of better traction in hill-climb races. The Vauxhall Villiers was sucessful at hill-climbing and sprint races, but it was known to be a very tricky car to handle. Here Raymond Mays grimly clutches the steering wheel. You could argue all day if this really counts as six wheels rather than four wheels, but let's not. Why anyone thought that holding up a grimy sheet behind the car would make a better picture is unknown. This is Professor Fate's Hannibal Twin-8 car from the 1965 movie The Great Race. Jack Lemmon played the evil Professor Fate, opposite good guy Tony Curtis. (I saw it when it came out and I remember it as a good film) Sources differ as to whether three, five, or six were built, which is at least two more than some of the machines in this gallery. However it seems likely that only two of the cars were fully functional. 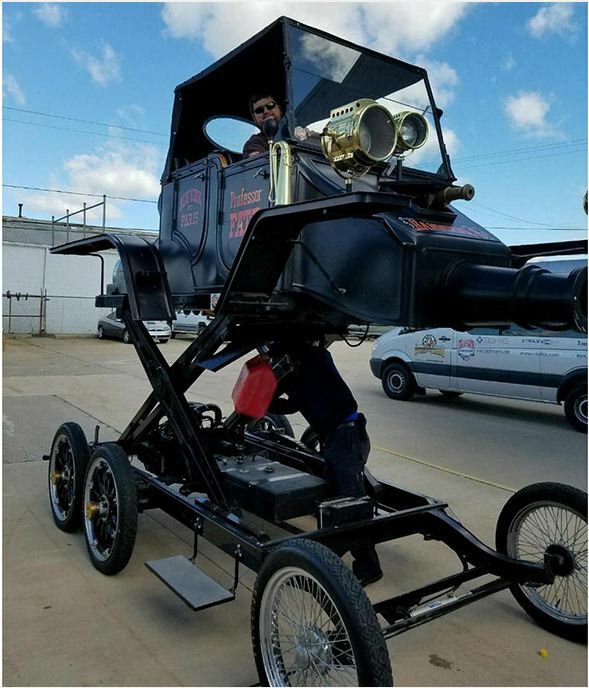 Unusual features are that the bodywork really can be raised 9 feet above the chassis by hydraulic rams, and there was a fully functional smoke screen generator. However, the retractable brass cannon pointing out of the front is not likely to fire anything other than a small pyrotechnic, and the nose that could be made to glow red-hot (for melting snow drifts) was just a lighting effect. Power is from a Corvair flat-6 with a 3-speed manual gearbox; all four of the rear wheels are powered by a chain drive. The Hannibal Twin-8 remains in its original and un-restored condition just as it was last used on the movie set. It is still fully operational, and it actually runs and drives. It even has a 1965 assigned VIN and could be titled, registered and driven over the road. The exact significance of the name is obscure. I seem to recall that the fictional car was supposed to have twin engnes, but attempts by the Museum staff to confirm this have so far failed. As for the '8' surely they didn't mean twin V8 engines? There is a video of Jack Lemmon extolling the features of the Hannibal Twin-8 on YouTube. The car appears at 0:40. The Tyrell P34 was a six-wheeled Formula 1 racing car first unveiled in 1975. It was first tried on the track at Silverstone on 8th October 1975. After much testing, Tyrrell decided to build two more 6-wheel cars to race in the 1976 season. The idea behind the P34 was the use of front tyres that would fit in with the streamlining. This would have two effects; this would be to lower overall drag and also provide smoother airflow to the rear wing. The wheels were only 10 inches (250 mm) in diameter, and because of the small contact patch with the road, four were required to give good cornering. The high point of the P34 story was the 1976 Swedish Grand Prix; Jody Scheckter and Patrick Depailler finished first and second in their P34's. Scheckter remains the only driver ever to win a race in a six-wheeled car. 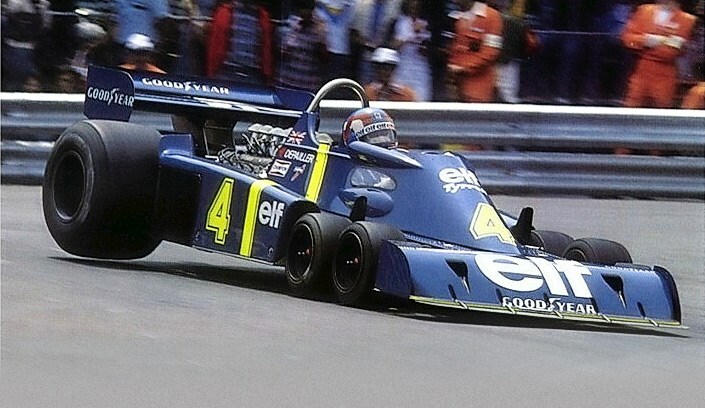 However various handling problems emerged and Tyrell's design for the 1978 season had four wheels. One P34 has survived and is often seen at historic racing events. Looks like daylight under that rear wheel. There is a Wikipedia page for the P34. This Six was built by the retro-sportscar manufacturer Panther, owned by Robert Jankel. Top speed was claimed at 200 mph, but Panther went bankrupt before any were sold. The Panther Six is mid-engined with a 8.2 litre Cadillac V8 powerplant with twin turbochargers. Only two cars were built, one white and one in black, and both are known to still be in existence. The rear wheels are fitted with 265/50 VR16 tyres, and the two pairs of steering front wheels with 205/40 VR13 tyres. In the tyre codes the 16 and the 13 give the diameter of the wheel rim; it is therefore necessary to carry around two spare wheels of different sizes. The Panther Six has a Wikipedia page. This remarkable vehicle was built by Wolfrace to promote their alloy wheels. And what better way to do that than produce a car with more wheels than normal? It was powered by two Rover V8 engines, apparently controlled by a throttle-by-wire system. There was a spaceframe chassis, and rear-wheel drive through a Jaguar rear-axle and differential. 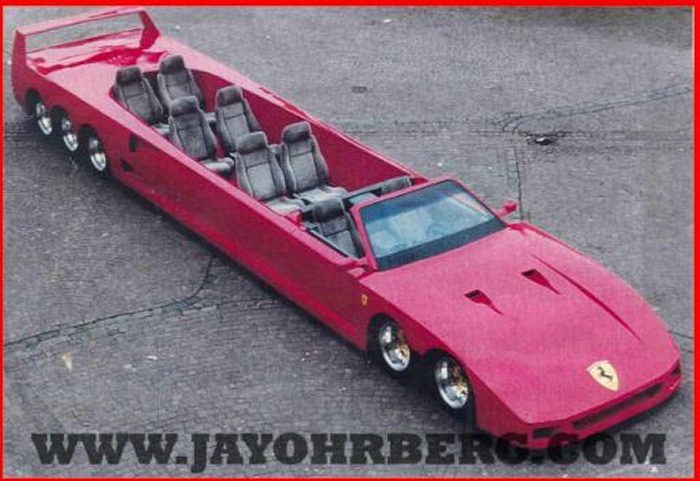 Despite the immense length of the Batmobile-style body, it was only a two seater. It was designed by Nick Butler and was a big budget project costing about �100,000. On the 2nd of March 2015 the Sonic was sold on Ebay for �18,100 to an unknown buyer. I am glad to report that Wolfrace are alive and well. The idea here was to combine a small car suitable for solo commuting with a big van that could haul the whole family around on vacations. It was shown at the 1990 North American Auto Show. The front car detached and ran on four wheels; it had seating for three in individual bucket seats, arranged in a single row. 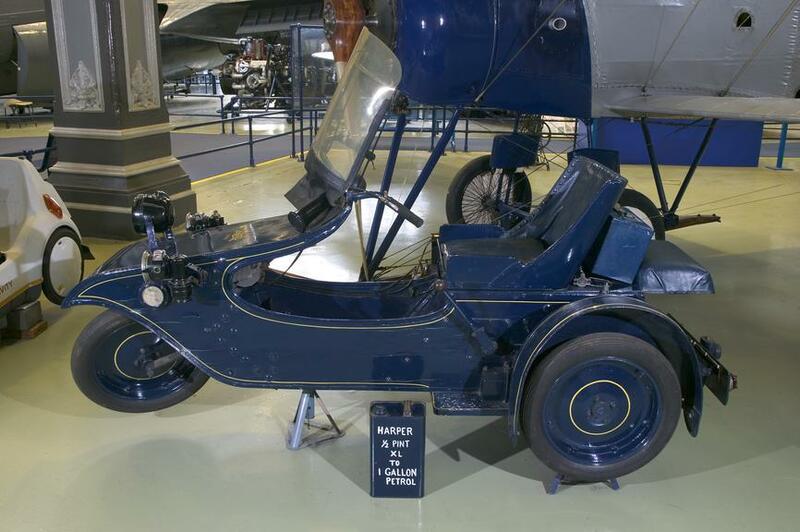 (which surely must have made the 'small car' rather wide) It was powered by a three-cylinder engine fuelled by propane and driving the front wheels. The detachable rear section provided seating for eight more passengers, making 11 occupants in all. It was to be powered an independent 2.2 litre four-cylinder engine, with the two engines were linked electronically. For maximum fuel economy, use of the rear engine was intended to be optional when the segments were joined, but it is hard to believe a three-cylinder engine could safely move the combination. When both engines were in use the two-engine configuration gave the Voyager all-wheel drive traction, so presumably both rear axles were driven. You are probably wondering what happens to the rear wheels of the front unit; they retracted underneath the Voyager III when the two halves were joined, with aerodynamic skirts covering the open wheel wells. So... is that four wheels, six wheels, or eight wheels? All of this was obviously heavy and expensive to manufacture, and had the crippling snag that it would certainly have been cheaper to buy a small car and a big van separately; having two complete vehicles is clearly far more flexible. This is the small-car section, with its rear wheels in action. It was powered by a three-cylinder engine running on propane. The wheelbase of the fully-assembled Voyager III was 122 inches, and the overall length 199 inches. There is a Wikipedia page, where the car is referred to as 'the Plymouth Voyager 3'. 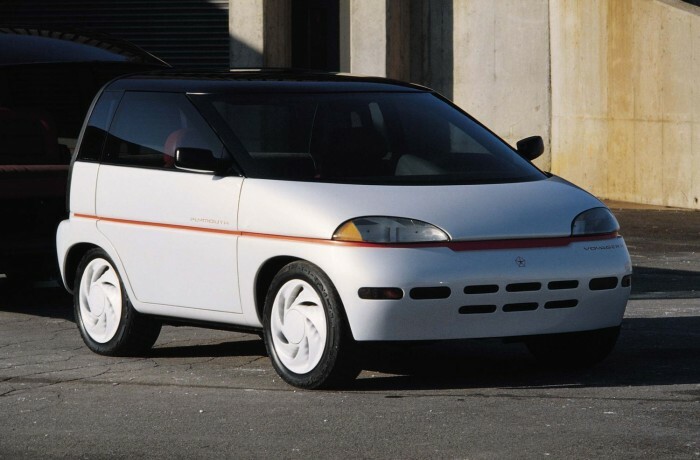 The car is referred to as the 'worst concept car of all time' here. I'm not arguing. The Covini is a The Covini C6W is a six-wheeled Italian sports coup�. It is claimed that it was directly inspired by the 1976 Tyrrell P34 above. In 2004 the C6W was first shown in prototype form. Small-scale production began in 2005 at the rate of 6-8 cars per year, and is believed to be still continuing. The car has 4200 cc 8-cylinder engine mounted at the rear and a claimed top speed of 186 mph. The transmission is a 6-speed manual box. Lady Penelope was the posh piece of tottie in the Thunderbirds TV show. She drove around in a shocking-pink Rolls-Royce with six wheels, usually chaffeured by Parker, a reformed burglar. 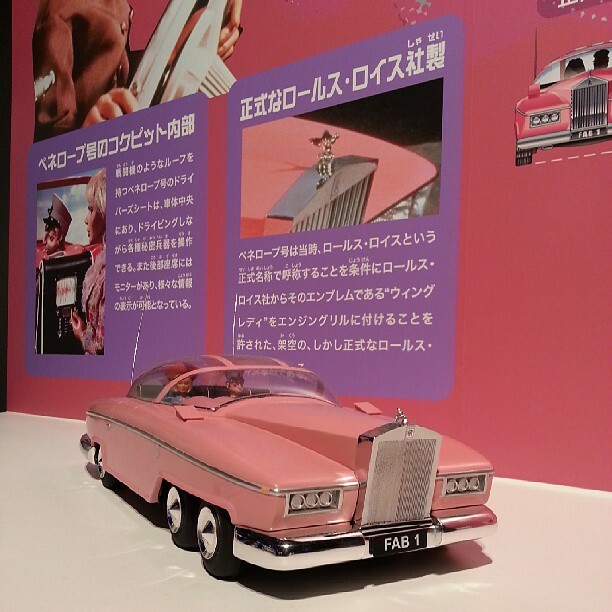 There were various versions of FAB-1; this late version is at a show in Toykyo in 2013. Note Parker driving and Lady Penelope in the back. In case you're wondering, 'Fab!' short for 'Fabulous!' was a common exclamation in the Swinging Sixties. OK, I will admit that finding a seven-wheeled car is proving difficult. Any ideas? An eight-wheeled car is however easy. 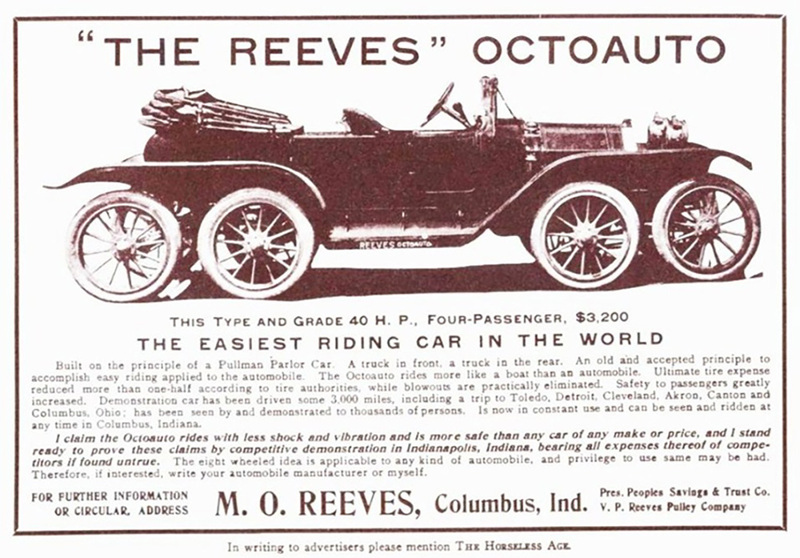 The Reeves Octo-Auto was a 1910 Overland modified by Milton Reeves. It had a 40 HP engine and was more than 20 feet long, carrying four passengers. It was a commercial failure. Unfortunately this picture reveals nothing about how the suspension was arranged. This is not much more informative about the suspension, though we can see a conventional axle for the front two wheels. Clearly taken at the same time as the photograph above. This suggests that the front axle was simply held by two struts running backwards. The ad copy claims 'blowouts practically eliminated', though I would have thought that having twice as many tyres could only increase your chance of picking up a nail. Another picture of the Octo-Auto at an unknown location. 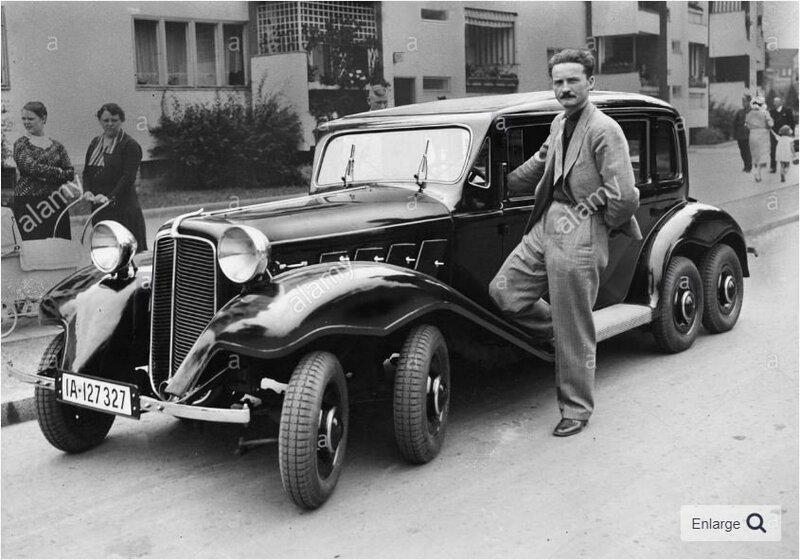 In 1935 German engineer Gotthard Rimmek patented his first eight-wheeled model. 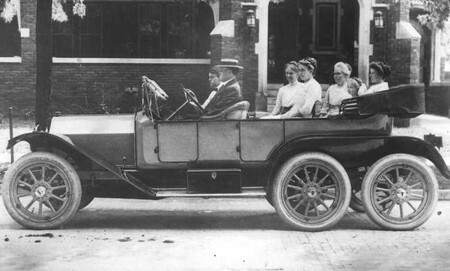 The first prototype was a converted Brennabor car in 1925. This was followed by a more sophisticated conversion of a German Adler Diplomat, a big six-cylinder 3-litre saloon introduced in 1934. The conversion boasted 'oscillation parallelograms in a progressive suspension" and when I find what that means I'll let you know. Rimmek applied for a German patent in March 1926, and patent DE452836C 'Kraftfahrzeug mit zwei vorn und hinten angeordneten abgefederten Radachsenpaaren' was granted in November 1927. The title just means 'Motor vehicle with two front and rear sprung pairs of wheel axles' which tells us nothing more. Apart from this no further history of the Rimmek cars has been discovered by the Museum Staff. This looks as though it came from Popular Mechanics, or a similiar publication. Left: The Rimmek eight-wheeler in Siemensstadt, Berlin: 1935? The location is the intersection of Goebelstra�e and Quellweg in Siemensstadt, in the north-west of Berlin. The area is called Siemensstadt as it was purpose-built housing for the employees of the Siemens electrics works. As for Goebelstra�e it is named after the inventor Heinrich Goebel. Things have not changed much there; see Google streetview. For some reason the photograph was taken on the tilt. The report claims that "...most road shocks in motoring are caused by rebounds from the bumps as the wheels drop into potholes, these are almost eliminated... as one wheel passes over the pothole, its neighbour is still on level ground, holding the car on its straight, smooth passage." I appreciate that road-building standards in Australia in 1935 may have been different from what they are now, but I am not wholly convinced this is an accurate description of car suspension dynamics. It does however seem to give some insight into what Rimmek was aiming at. However this is contradicted by the magazine piece just above, which suggests that improved traction in mud and sand was the aim. 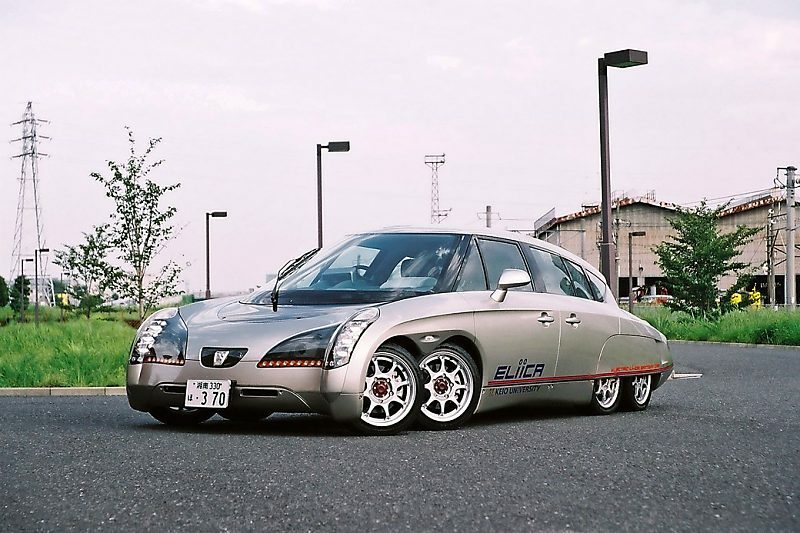 The Eliica was and is (the project appears to be in continuous development) electric car developed by Keio University in Japan, first shown in 2004. It uses lithium-ion batteries. It is allegedly faster than a Porsche 911 Turbo. Despite its large size it only seats four people. The Eliica has eight wheels, supposedly to improve traction. They are smaller than normal car wheels, allowing the vehicles to be closer to the ground for better aerodynamics and stability. Each of the eight wheels is driven by a 60 kW (80 hp) electric motor, giving 480 kW (640 hp) eight wheel drive in total, with regenerative braking to recover energy. The four front wheels steer. Each of the eight wheels has a disc brake. Eight-wheel drive might in theory allow the Eliica to deal with all kinds of road surfaces, but the low ground clearance suggests that off-road operation is not a sensible option. Smooth acceleration of about 0.8 g is claimed. 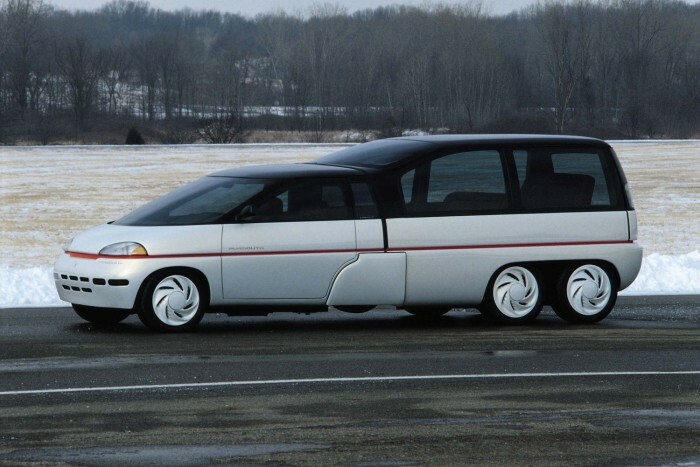 The Eliica is a development of the earlier KAZ (Keio Advanced Zero-emission vehicle), which was a 6.7 m (22 ft) limousine-sized 8-wheel 8-person electric vehicle prototype announced in 2003. I will further admit that finding a nine-wheeled car is proving no easier than finding a seven-wheeled car. No problem at all. This car- and I submit it is more a car than anything else- was built by Michelin in 1972, when they were major shareholders of the Citroen company. 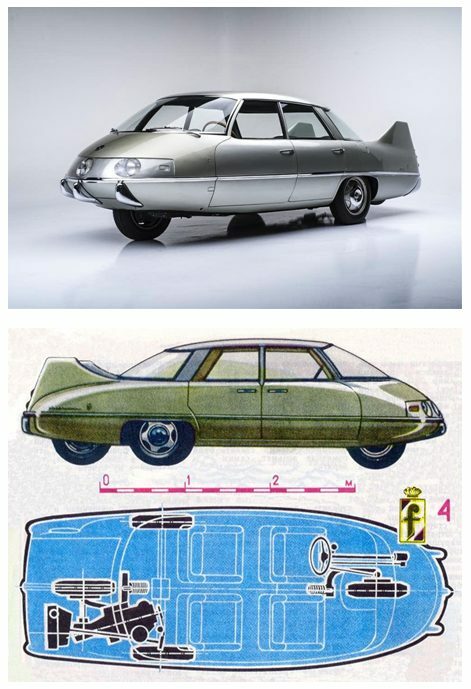 It is officially called the Citroen DS PLR break, where PLR stands for Poids Lourd Rapide meaning heavy fast truck. 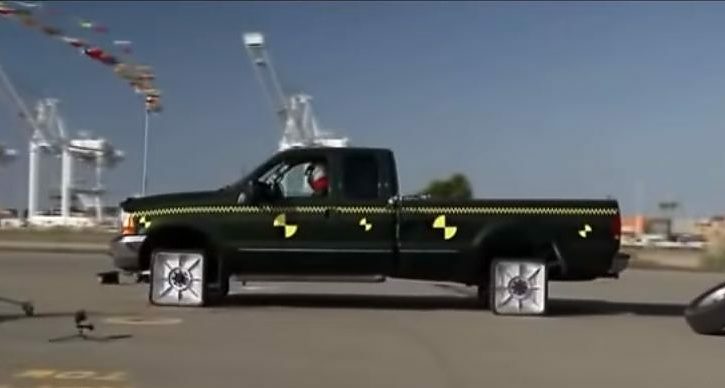 It was built as a way of safely testing of truck tyres at speed on a real road. Unofficially it is known as the mille pattes or 'thousand paws', which is the French word for centipede, not, as you might expect, millipede. I feel obliged to point out that no millipede has as many as 1000 feet; the record is up to 750, for Illacme plenipes. The mille pattes has four wheels at the front, and six wheels at the back. Why so many? 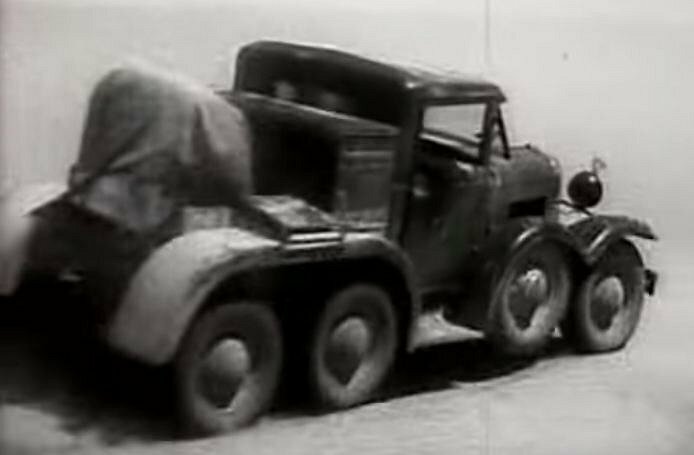 Because the vehicle was loaded down with lead until it weighed 9.5 tons; this was so that realistic truck loadings could be placed on the tyre under test. A strong metal casing retained tyre fragments if it disintegrated, and the ten other wheels allowed control to be maintained if that happened. In fact it was only ever used on a closed test circuit. 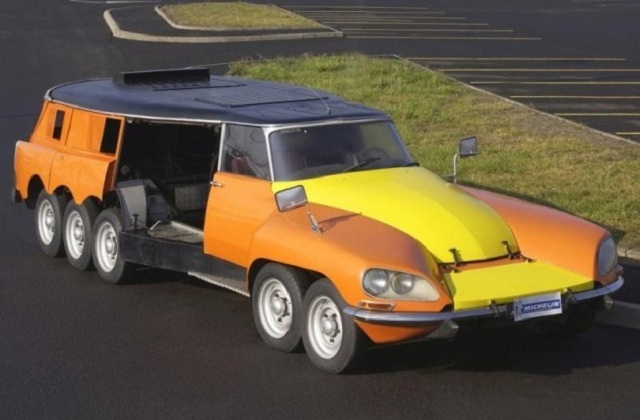 The car used as many standard parts as possible, and so bears a distinct resemblance to a Citroen DS. The tyre to be tested was installed in the centre of the car, shown open in this picture. It is powered by two 454 Big-Block Chevrolet engines, one of which drove the rear six wheels, and the other the tyre under test. Top speed is over 110 mph. The mille pattes has a Wikipedia page. 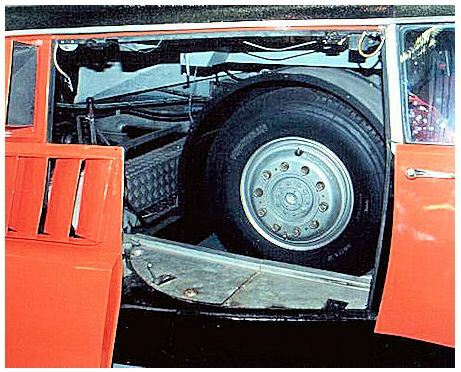 Here one of the side-panels has been removed, showing the enclosure for the tyre under test. You can learn more about this wonderful vehicle here. There is a video on YouTube. Die cast models were made in 1972 and sometimes surface on Ebay. The mille pattes is no longer used for tyre testing but remains in use as a promotional vehicle. It spends most of its time at the Michelin Museum in Clermont-Ferrand. Many thanks to Sean O'Brien for bringing this remarkable machine to my attention. 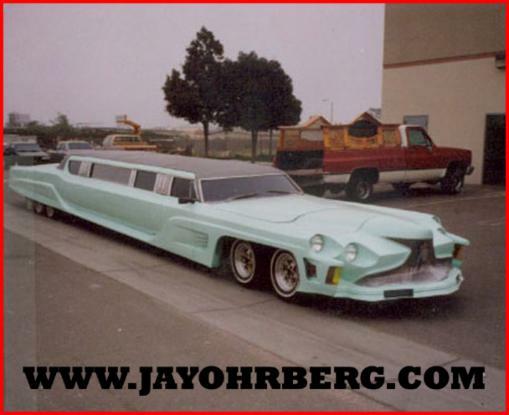 Built by Jay Ohrberg. (see below) Unfortunately no technical details are currently available. Four wheels at the front and six at the back. Left: Truck tyre installed in the mille pattes for testing: 197? Well, I'm quite sure you saw this coming. The milles-pattes car has eleven wheels on the road when a truck tyre is installed for testing. In the YouTube video a test tyre is fitted. Here we have six front wheels, and twelve rear wheels, for a meritorious total of eighteen. You may be wondering why twelve wheels are required to support the rear of the car; it's because that's where the swimming pool is. 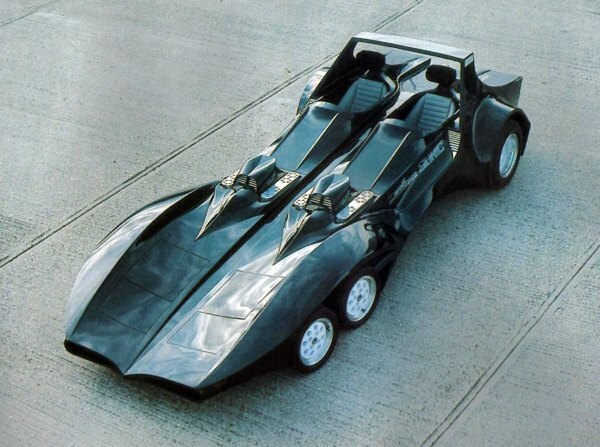 Jay Ohrberg of Burbank, California, is an Amercan constructor of special cars, including several Batmobiles and KITT from Knight Rider. 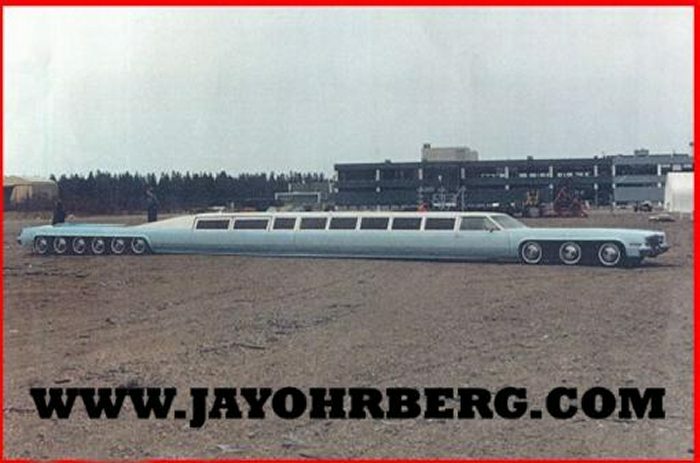 This 100-foot vehicle is accepted by the Guinness book of Records as the world's longest car. Here we have six front wheels, eight middle wheels, and ten rear wheels, for a grand total of 24 wheels. This is not photoshopping. Many more pictures of the American Dream can be seen at Jay Ohrberg's website. 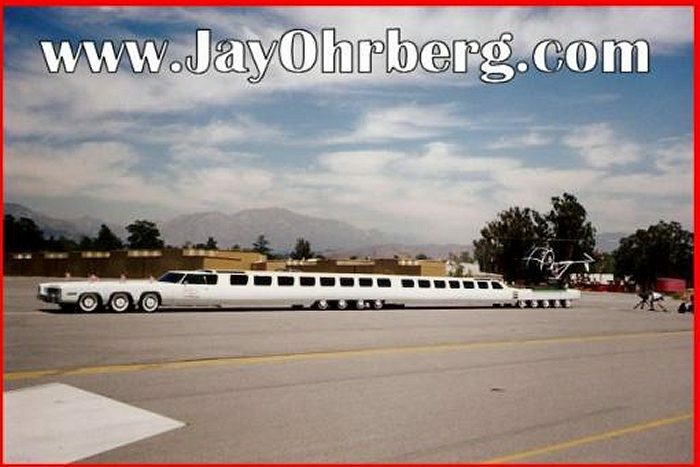 There is a helipad at the rear of the limo, over the rear wheels, with a helicopter sitting on it. Regrettably it is apparently not being well looked-after by its current owners. Jay Ohrberg has a Wikipedia page. I asked Mr Ohrberg by email for permission to post a pic or two, but have had no answer so far.